This is the first of a series of seven volumes of the research articles and general surveys of Prof. Lokesh Chandra. Collected from several obscure and inaccessible publications, it is a collection of writings that emerge from a broad spectrum of quests in Sanskrit and Iranian, Greek and Latin, Celtic and Slavic, Si no-Japanese and Tibetan, Thai and Indonesian history, art and linguistics, Tantras and Buddhism. The volume opens with a study of stupa, mandala, ideographic configuration and encoding of time in monuments. The vantage view of a classicist can be seen in the author's analysis of creativity and environment. The presentations on a shared earth, technology and cultural identity, and emerging paradigms seek new realities of human striving. In Calligraphy: thirst for the yonder form' the author surveys calligraphy in historic and creative contexts. From calligraphy, the volume moves on to translation as a crucial factor in the evolution of the Chinese, Tibetan, Mongolian, Manchu, Indonesian, Greek, Latin, German, Slavonic and English literary traditions. India and world literature, Dance: the divine art, India's thought and human destiny represent the creative continuity of India's culture. The sculptures of Ellora are identified anew, besides the general role of the caves as a syllogism of the soul. 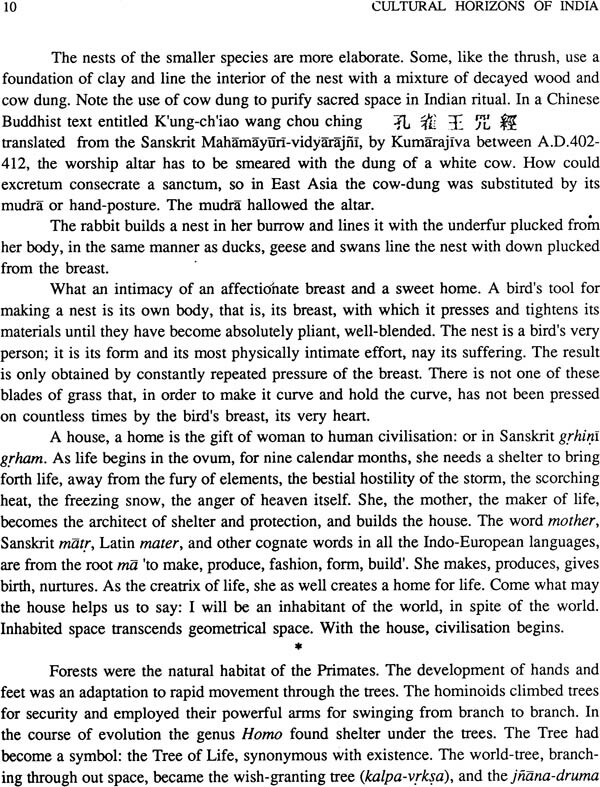 The author points out that the earliest Sanskrit manuscripts come from Turfan in Central Asia and from Nara in Japan. 'Buddhism as a pan- human syndrome' is an evaluative survey of developments within Buddhism and of its spread in several lands because of historical vacua and creative contexts. 'Kanchi and the cultural efflorescence of Asia' highlights the role of this great city in the development of international relations. A comprehensive bird's eye-view of the Mahabharata in the literatures as well as visual and performing arts of Cambodia, Japan, China, Mongolia, Thailand and Indonesia. He presents an overview of the linguistic, mythological, political and economic relations of India and Greece in 'The cultural symphony of India and Greece'. In an overarching study of Sanskrit and Bulgarian, Prof. Chandra projects a new model for the original language and homeland of the Aryans/Indo-Europeans. The cultural encounter of Buddhism and Japan is covered in six articles. The book ends with 'Surya in East Asia'. It is a collection of 51 articles of Prof. Lokesh Chandra and is of interest to students of culture in general, Buddhologists, historians, linguists, Indo- Europeanists, Indologists, Japanologists, and scholars in allied fields. Prof. Lokesh Chandra is a renowned scholar of Tibetan, Mongolian and Sino-Japanese Buddhism. He has to his credit over 360 works and text editions. Among them are classics like 'his Tibetan-Sanskrit Dictionary, Materials for a History of Tibetan Literature, Buddhist Iconography of Tibet, and his ongoing Dictionary of Buddist Art in about 20 volumes. Prof. Lokesh Chandra was nominated by the President of the Republic of India to the Parliament in 1974-80 and again in 1980-86. He has been a Vice-President of the Indian Council for Cultural Relations, and Chairman of the Indian Council of Historical Research. Presently he is Director, International Academy of Indian Culture. The present series of seven volumes will span the last fifty years of research articles of Prof. Lokesh Chandra. It will include most of his general presentations as well as research papers that lie scattered in over a hundred publications, many of them inaccessible. This half a century has been the flowing onward of the essence of life, in an effort to create ever newer eyes. Out the depths of the mind of India and her inter- actions with other countries of Asia have emerged new sensibilities of expanding awareness of the vanishing and the enduring in the permanence of change. The varied human responses in the rhythms of time enable us to understand the endless continuum of culture. They form the brigde from the perceptible to the non-perceptible. In the perennial or sanntana of India and Buddhist Asia, events and symbols, time-intervals and eternal continuities are homogenous and interpenetrative. Thus the stream of our eternal time forms indivisible links in an unbroken whole of that has been, of that is and of that will be. In this is our hope and history, resolve and resurrection. This volume as the first of the series portrays the evolution of ideas that emerge from a broad spectrum of quests in Sanskrit and Iranian, Greek and Latin, Celtic and Slavic, Sino-Japanese and Tibetan, Thai and Indonesian history, art and linguistics. The volume opens with a study of 'Life, space and structures' (p. 9f. 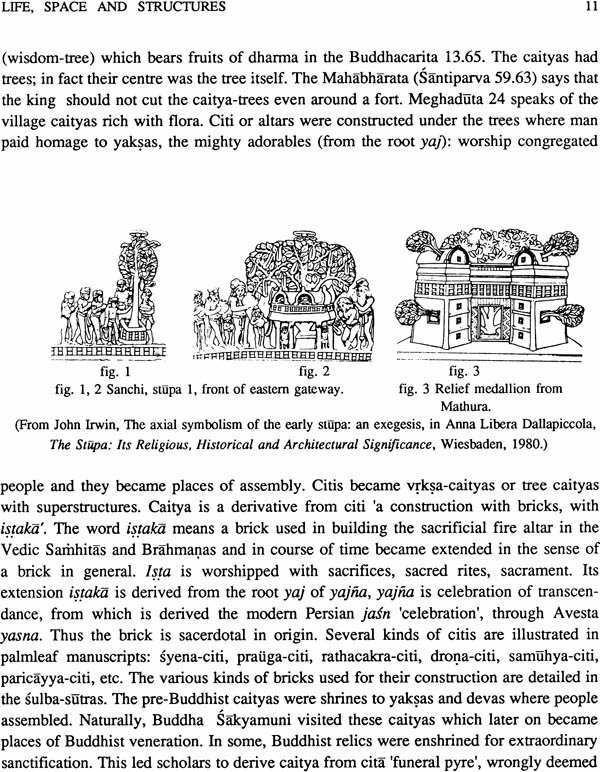 ): caitya or stupa as the cosmic rhythm of space, from the cosmic city to a Tantric mandala, time embodied in structures, ideograms in the configuration of monuments. Prof. Lokesh Chandra traces them back to the roots of biological instinct, from manusya the thinking man (man 'to think') to the animal that breathes (Latin anima 'breath') or the pasu that sees (pas 'to see'). The tenacity of life emerges from love and finds its continuity in structured living space, and finally converges in the symbolisation of sanctified space. The complementarity of the biological and the trans-human is apparent in etymologies embedded in words themselves. The vantage view of a classicist and humanist can be seen in the author's analysis of creativity and environment (p. 19f.) from the depths of the Rgveda, from the metaphoric fragments of Greek myths, or the Chip Buddhas of Enku, or in pluralism in the ideas of Nietzsche or Goethe. Nature as the human environment from the Vedic to the Puranic traditions is the sap and sinews of India's culture. The presentations on a shared earth (p.28f. ), technology and cultural identity (p.33f. ), and emerging paradigms (p.35f.) seek new realities of human striving in India's cultural syndromes. In 'Calligraphy: thirst for the yonder form' (p.39f.) the author surveys the etymology of the English word as the flapping mind of civilisation. Calligraphy as aniconic sanctity, as poetry and painting in China-Korea-Japan, or as sublime austerity of Zen are detailed in creative and historic contexts. 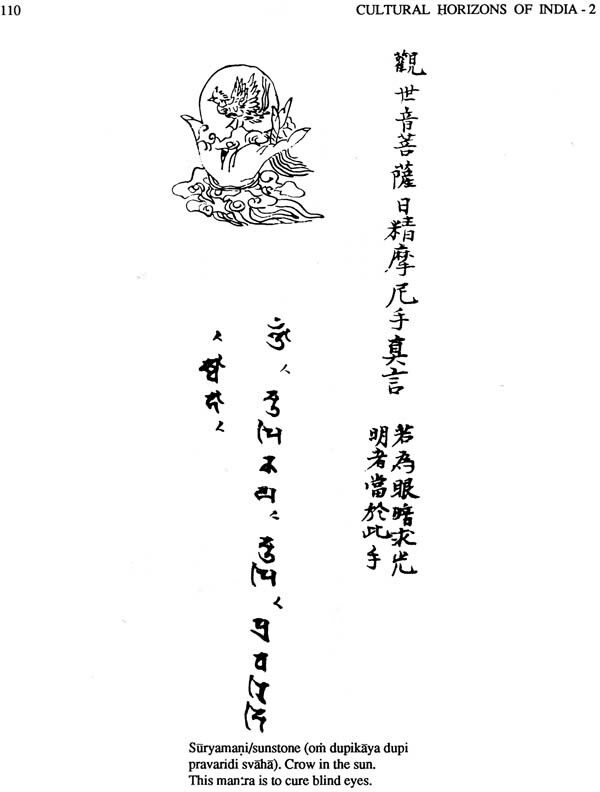 From calligraphy, the volume moves on to translation (p.46f.) as a crucial factor in the evolution of the Chinese, Tibetan, Mongolian, Manchu, Indonesian, Greek, Latin, German, Slavonic and English literary traditions. The effortless innocence of known and unknown translators sharing new intellectual flows have enriched human thought. The modem world itself was born of the translation of Greeek works into Arabic. The time and vision of India became the creation and continuity of a number of literatures in the world (p.58f.). Lucian, the satirist of the second century A.D., says that the Goddess of Philosophy first descended upon the Indians. 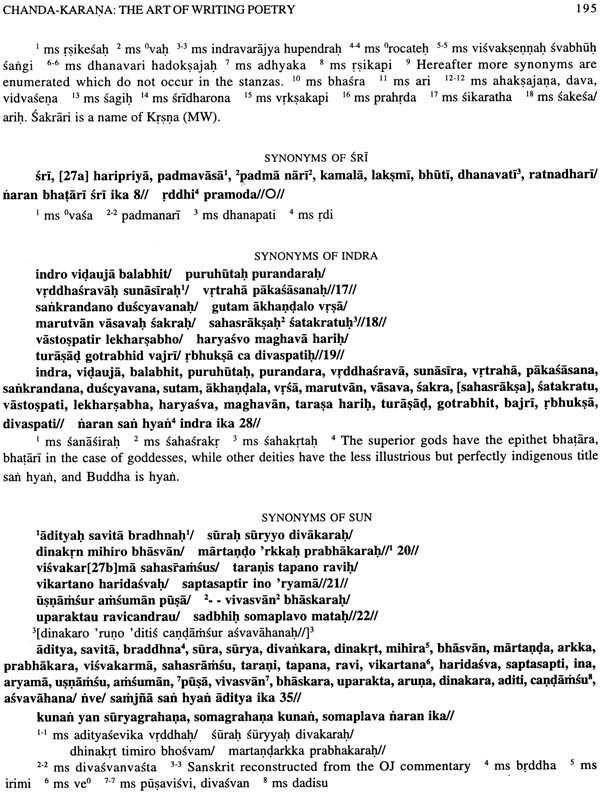 The Indo-European elements in Greek and Latin languages and thought find explanation in the transparency of Sanskrit. The literatures of Central, East and South-East Asia share minds with India in their exploration of the immensity and the depths of life. From dance (p.64f.) in Indian, Hellenic and Chinese cadences the author moves on to India's thought and nature (p.69f. ), logic and aesthetics. In Ellora (p.72f.) he reveals the oneiric caves as the syllogism of the soul, the creation of caves over the centuries, their illumination with murals or their sunyata filled with sculptures, and the identification of these paintings and icons from classical sources. 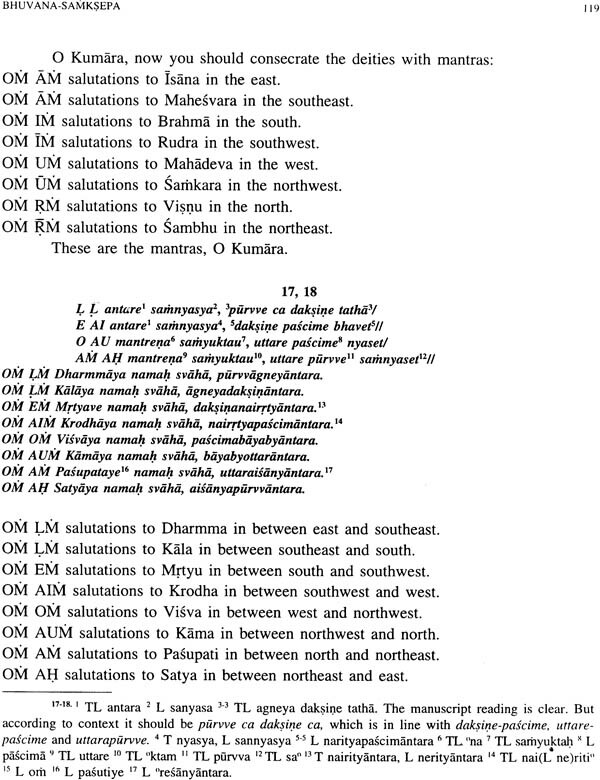 The author points out that the earliest Sanskrit manuscripts (p.8lf.) come from Turfan in Central Asia and from Nara in Japan. While the historical evaluation of manuscripts is a contribution of European scholarship, the history of institutions like democratic republics has been pursued by Indian scholars in refutation of the prejudiced views of James Mill in his six-volume History of British India and others, an effort to detail the civilising role of White Man's imperialism (p.8lf.). The author is the son of Prof. RaghuVira the famous thinker, freedom-fighter, Indologist, explorer of manuscripts in North, East, Central and South East Asia, and the creator of words for sciences, humanities, commerce, administration and other modem needs in Indian languages. In "My father is merged into the majesty of infinity" (p.97f.) he reminisces about the work of his illustrious father. Prof. Raghu Vira was the only scholar to be permitted by the Government of Mongolia to microfilm the Mongolian Tanjur. The microfilms were enlarged and deposited at Bonn and New Delhi. The author details the steps that led to this stupendous project (p.97f.). 'Buddhism as a pan-human syndrome' (p.lllf.) is an evaluative survey of developments within Buddhism wherein Buddha the Man, the Master was transformed into Lord, into the abstraction of Buddhahood. The historical vacua and contexts that led to its spread in several lands in the living stream of their hearts are discussed. From its formulations arose democratisation of socio-political structures, creation of alphabets, the evolution of printing technology (p.119f. ), and so on. 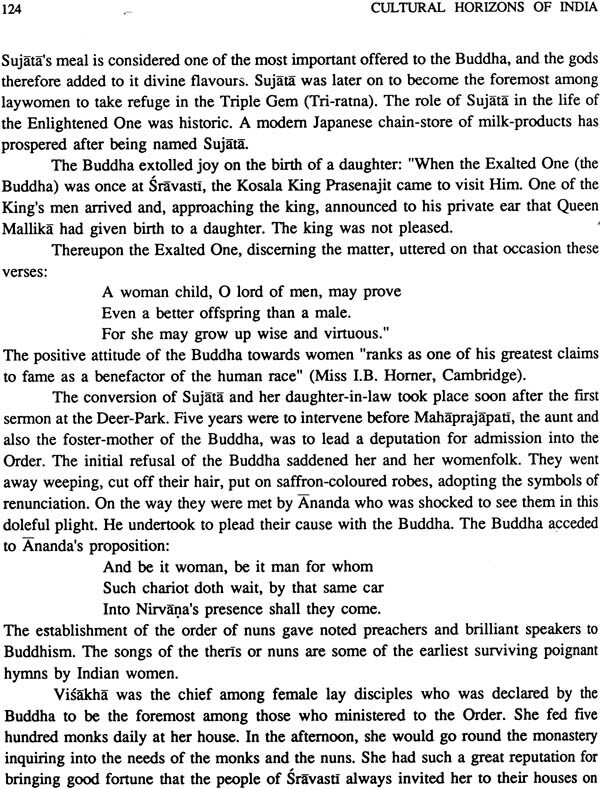 'Buddhism and women' (p.123f.) is an overview of the feminine, as wisdom (prajna), heroine (suri), and learning (vidya), beyond the maternal. 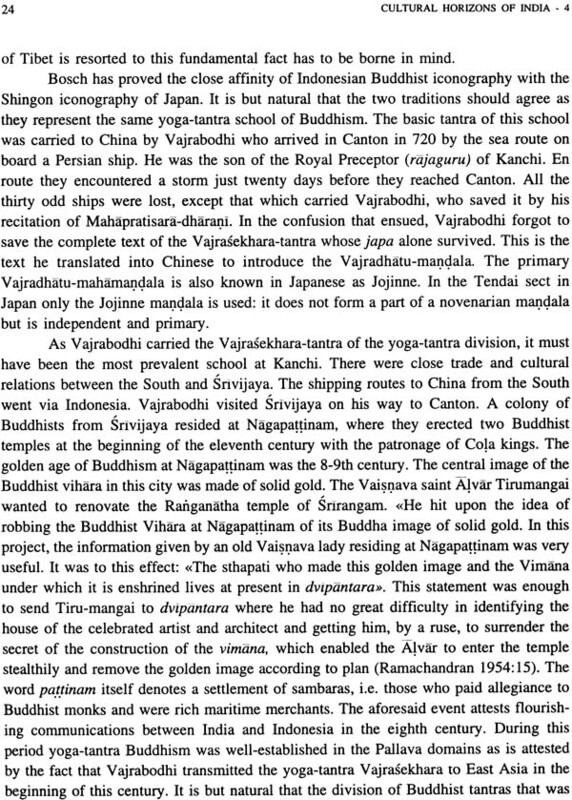 'Kanchi and the cultural efflorescence of Asia' (p.128f.) highlights the role of this great city in the development of international commerce, philosophies of Zen and Vajrayana, performing arts, architectural monuments like the Borobudur, tea ceremony, and so on. 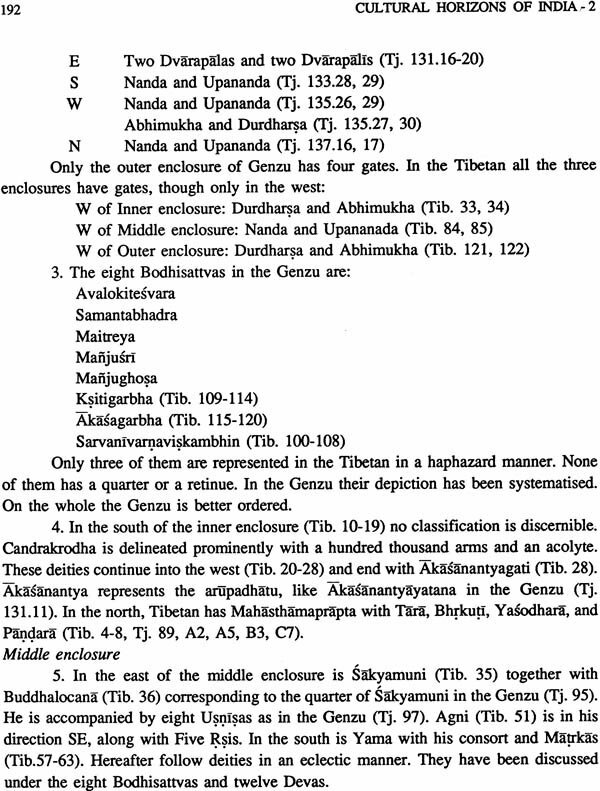 The next article pertains to the other extremity of ancient India, to Udyana, which is now Jalalabad (p.140f.). It was a city where Indian, Graeco-Roman, Iranian and Chinese minds and merchandise met in the jostling of merchants and pilgrims. It arose as a monastic city, and was appropriately termed Nagarahara, from nagara 'city' of the hara or vihara 'monastery'. Its sanctity, strangely enough, has survived in the Pathan mind till this day as Abdul Ghaffar Khan wanted to find his last repose here. Alongwith Gandhara, Udyana and Kapisa, Kashmir (p.143f.) played a pivotal role in the dissemination of Indian culture to Central Asia. Prof. Lokesh Chandra has collected evidence from Chinese, Tibetan and Arabic sources that bear on it. Thereafter is a comprehensive bird's eye-view of the Mahabharata (p.148f.) in the literatures as well as visual and performing arts of Cambodia, Japan, China, Mongolia, Thailand and Indonesia. Mahabharata is the overwhelming expression of Indonesian culture. 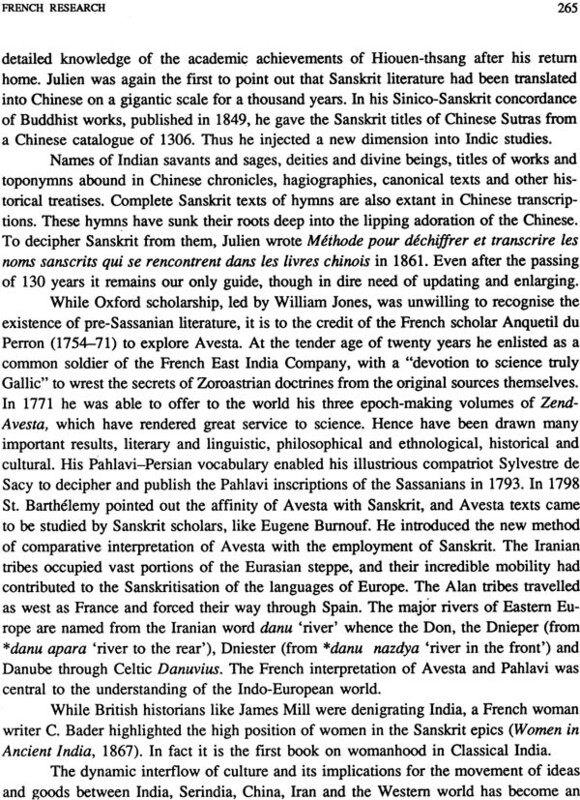 The passion of Europe for Hellenism led to her discovery of Sanskrit as a focal point for the conception of Indo-European (p.156f.) and the rise of Romanticism. These resulted in the encouragement of modern European languages. The Sanskrit Worterbuch of 1854 inspired massive dictionaries of German, English and other European languages. The author brings out a new view-point for the encounter of Europe and India in the early nineteenth century. He presents an overview of the linguistic, mythological, political and economic relations of India and Greece in 'The cultural symphony of India and Greece' (p.163f.). 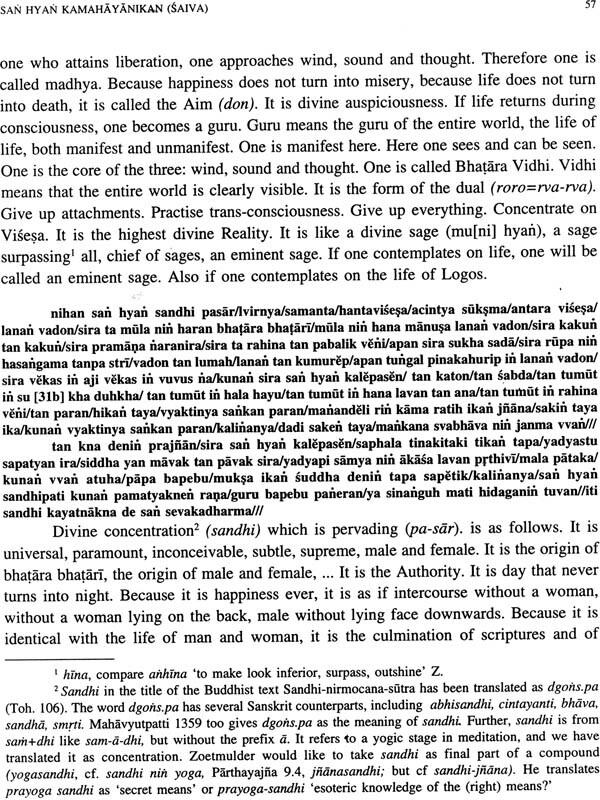 The close affinities of 'Lithuanian and Sanskrit' (p.174f.) follow. More contemporary concerns can be discerned in 'India and Austria' (p.182f.) wherein the author pleads that the East and the West are not closed systems, but have to function in a new global matrix. He resumes this approach in his address to the Academy of Sciences of Hungary (p.186f.) on the occasion of the conferment of the coveted honour of an Academician. The next article appraises the studies on the Hungarian national hero Alexander Csoma de Koros (p.19lf. ), who discovered a vast Sanskrit literature in Tibetan, and created the tools of a grammar and a dictionary for its understanding. With him a new vision of India's history dawned that was to inspire the Bengal School of India's cultural renaissance in the next century. The quest for roots has been a global concern for the last two centuries. 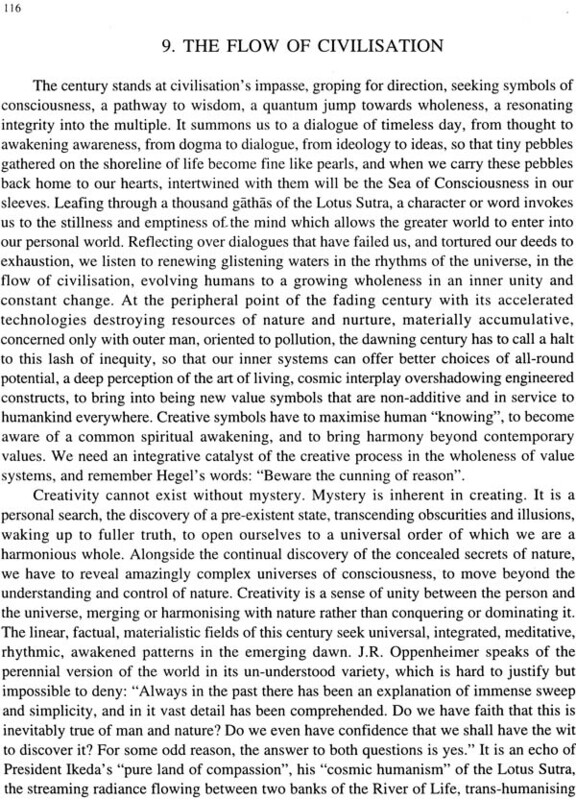 Prof. Lokesh Chandra portrays this dimension of our times in the dedication of Yeats (p.194f.) to a national Irish drama, a native theatre, as the eternal frontiers of Ireland sank their roots in his poems and plays. The intense feeling of Nikolai Roerich (p.199f.) for mother Rus and his aesthetic unison with India are the flowing current that escapes from his hands. 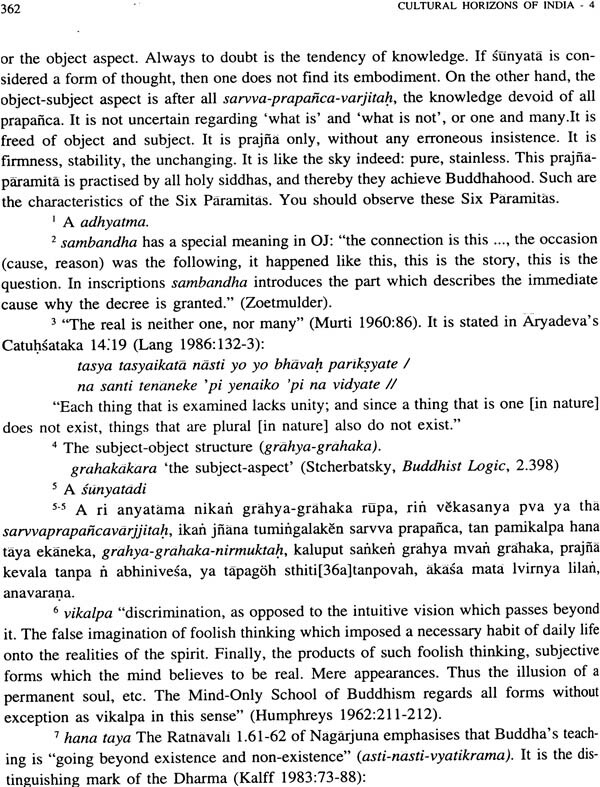 In an overarching study of Sanskrit and Bulgarian (p.205f. 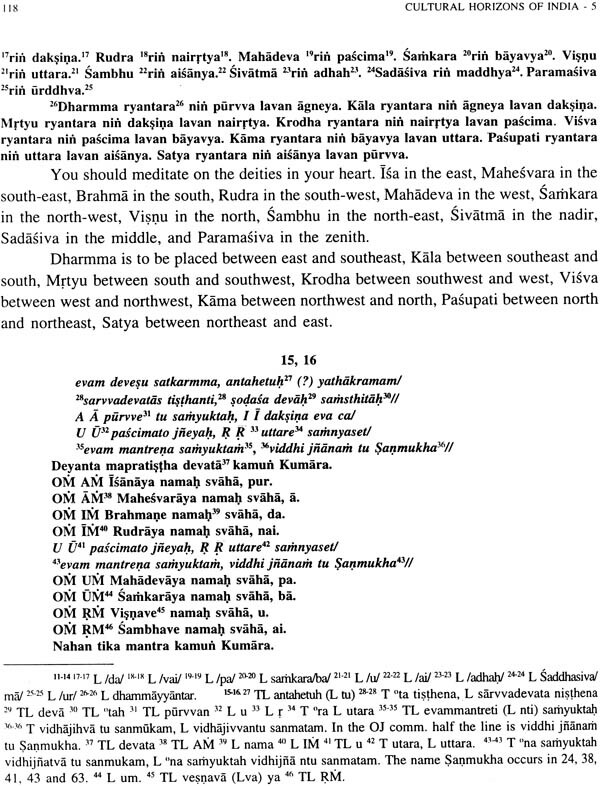 ), Prof. Chandra projects a new model for the original language and homeland of the Aryans/Indo- Europeans. The nineteenth century paradigrn of Drang nach Osten 'Push to the East' arising out of the imperial glories of the time conditioned the location of the home of the Aryans. The author points out that linguistic evidence of vocabulary does not point to a common original homeland of the Aryans, nor to a single Aryan identity, nor to a home in the West. The several layers of vocabulary indicate a Drang nach Westen, push from the East to the West, pre-Aryan substrates from earlier lost languages, with the superstratum of Indo-European grammar and vocabulary. 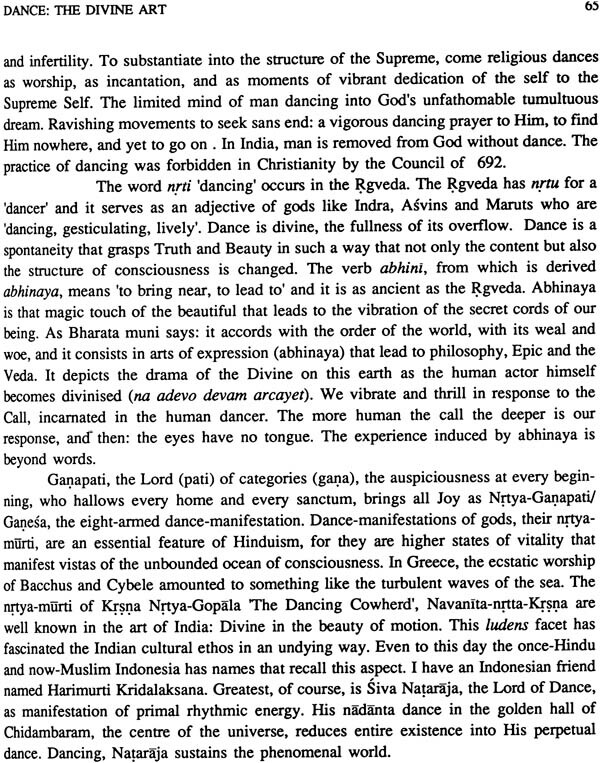 The volume leaps to South-East Asia in 'Unto the Siva Temple of Indonesia' (p.212f. ), a record of his visit to the Isles in 1967. He presents the interpretation of Candi Loro Jongran, Prambanan in the light of Saiva Siddhanta cosmology. Then that forget- me-not of Indonesian archaeology, the Borobudur (p.219f. ), the monument to love and compassion where the arid heart of man once recited: "Let Buddha be my refuge". In 1971 Indonesia convened the first international Ramayana seminar and festival. Ramayana is the epic of Asia, expressed in their narrative arts, belles-lettres, plastic and performing arts. The article provides a comprehensive view (p.223f.) of this adikavya in a short span, followed by a report on the performances at Pandaan in East Java. Prof. Lokesh Chandra is well-known for his wide-ranging studies on Tibet. Here are ~is papers on the symbolic meaning of the Tibetan flag (p.232f. 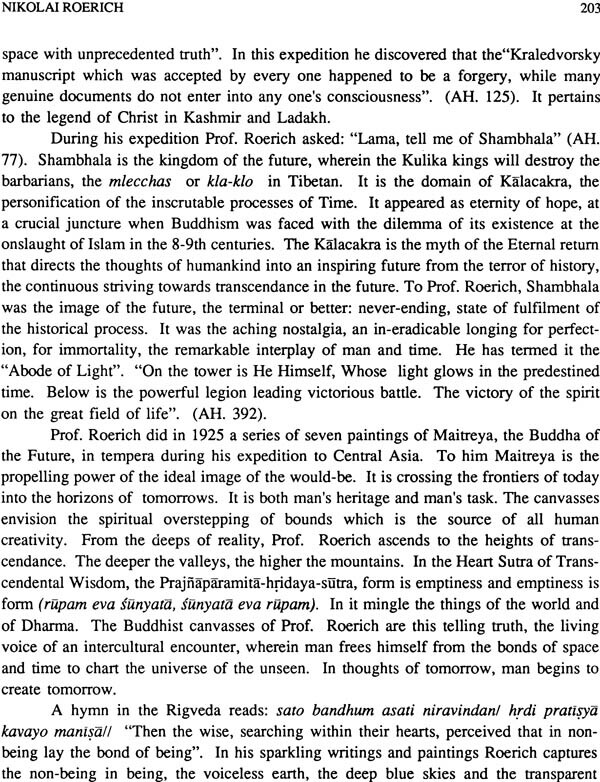 ), the narrative art of Tibet (p.236f.) 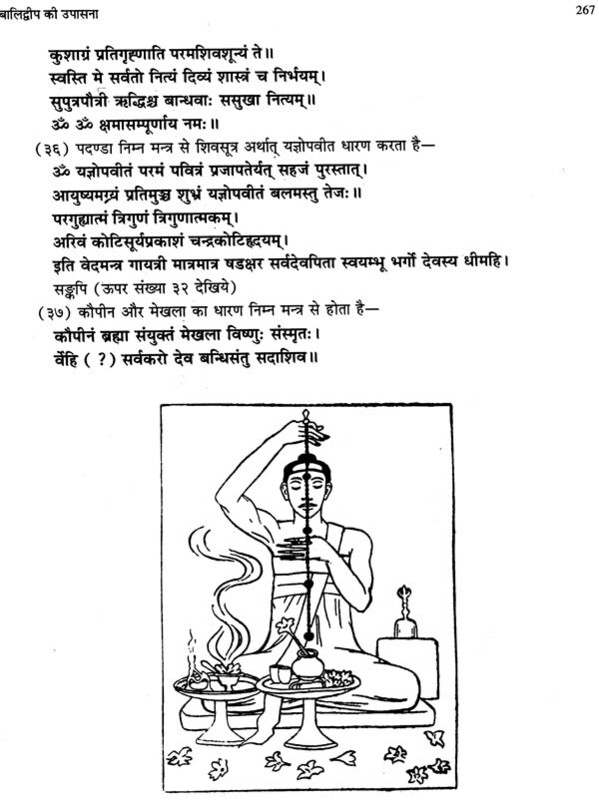 as represented by the Avadana-kalpalata of Ksemendra the polygraphist of Kashmir, and glimpses of the history of Indo-Tibetan medicine (p.242f.). The Tibetan form of Buddhism, called Lamaism (may be better termed Bhotayana), spread to the Mongols in what is now Mongolia and in Buryatia in transbaikalian Siberia. The author visited these areas in 1957 and 1967 in search of manuscripts and xylographs. 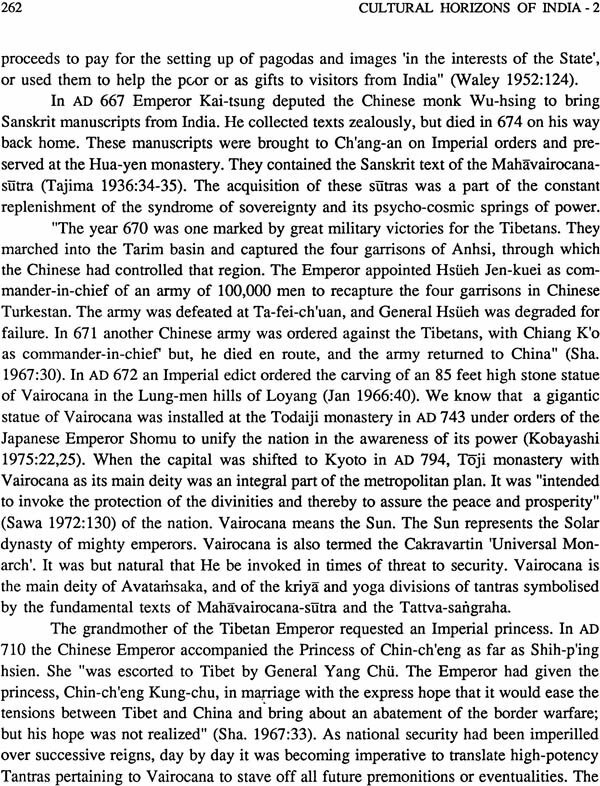 The reports of these visits afford a glimpse of Buddhism in Mongolia (p.246f.) 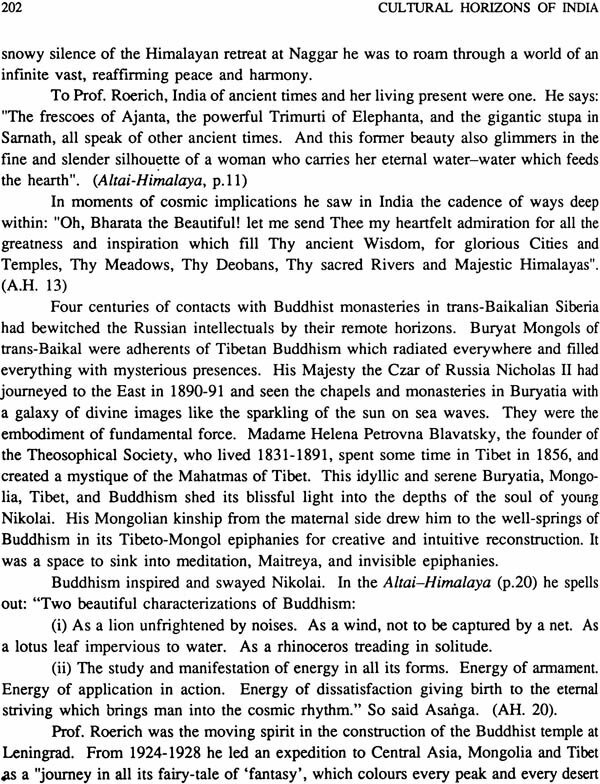 and in Buryatia (p.255f.) under the shadows of communism. The cultural interflow between India and China (p.279f.) is a symbolic echo of the time-honoured contacts. 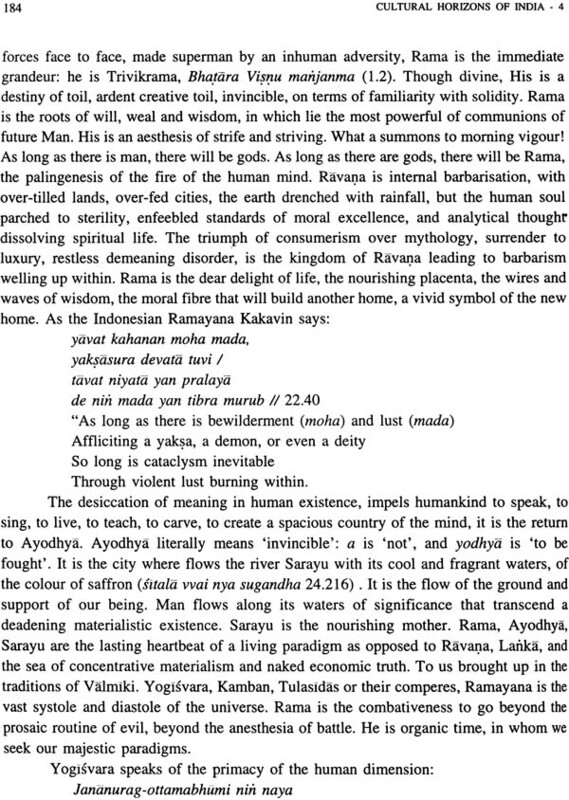 'Brahmana in the East Asian tradition' (p.283f.) is a study of the far-reaching contributions to Chinese science through the Polomen/Brahmana books out of which came revolutionary discoveries like the creation of the first mechanical clock by I-hsing in the ninth century, long before its European invention. The cultural encounter of Buddhism and Japan is covered in six articles. Japan has the second oldest Sanskrit manuscript, the oldest vina (A.D. 757), an alphabet based on the Indian sound-sequence, devas and naksatras, rsis and rasis, mudras and mantras. Japan's art is koreru ongaku 'frozen music' of forms. The aroma of Sakyamuni's land as it is found in Japanese cuisine is also discussed (p.32lf.). Dhyana to Zen (p.312f.) touches on the history and philosophy of Zen, a product of the Chinese and Japanese soil from the Indian seed of Enlightenment, in an Indian hut with Japanese bamboos. 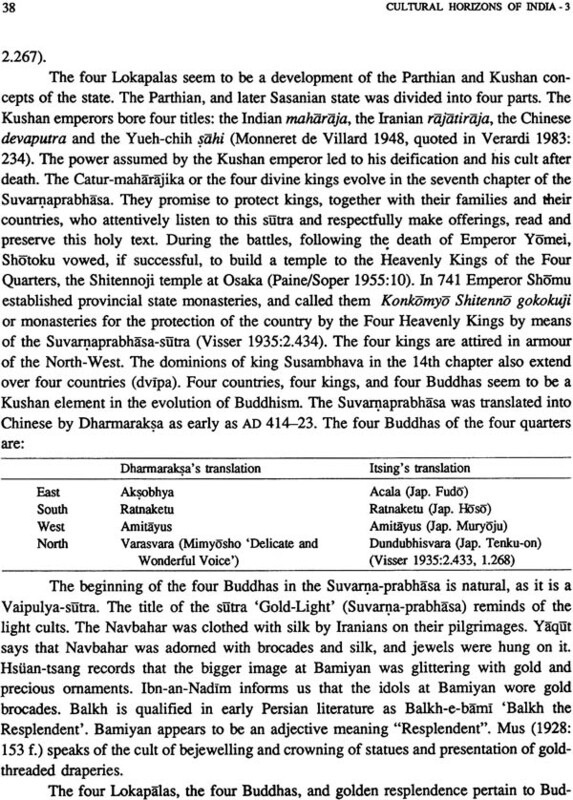 The book ends with Surya in East Asia (p.324f.) which points out outstanding images of him in Japanese art and ritual. Surya dispels the dark night of ignorance and is the illumination of life: tamaso ma jyotir gamaya. This volume comprises the studies of Prof. Lokesh Chandra on the iconography, syllabary, tantras, cultural heritage in general, defence, Canon and mandalas of Japan, Korea and China. 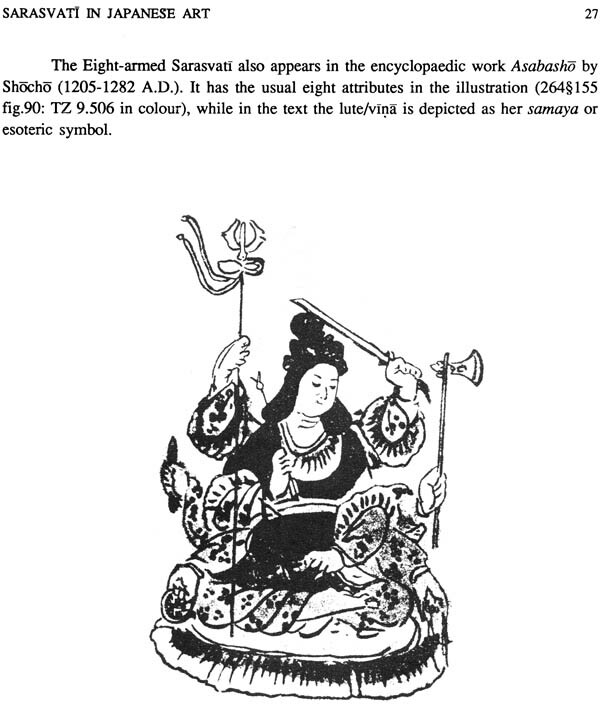 It begins with a detailed iconographic analysis of Ganesa in Japanese art from AD 806 onwards. Then follow the iconographies of Uma and Mahesvara, Usnisavijaya, Vaisravana/Kubera, Rocana the consort of Vairocana and Locana the apotheosis of the Eyes of Sakyamuni. 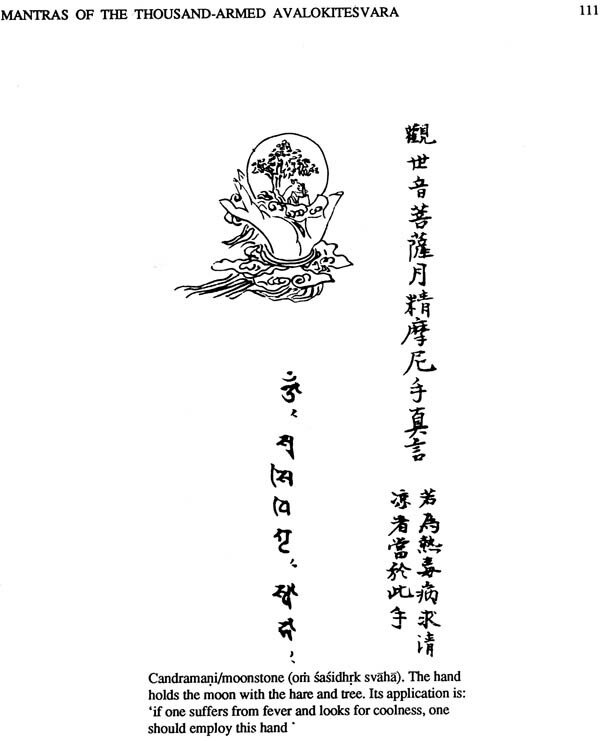 The mantras and characteristics of the forty main hands of the Thousand-armed Avalokitesvara are reproduced from a manuscript of AD 1781 in a Vairocana temple in the Hatamura village. The Twelve Light-Buddhas of Kakrak in Afghanistan, hitherto considered to be a mandala, have been identified anew with the help of Japanese sources. It is followed by a detailed study of Amitabha: epithets, descriptions in canonical texts, previous, births, views about him in Japanese sects, rituals in esoteric Mantrayana and iconography. A head from Khocho, murals at Bezeklik, Kumtura, Kizil and Turfan, and tiered stupa with niches at Khocho have been identified anew. The structure of the Japanese Garbhadhatu mandala and comparison with its Tibetan counterpart throws new light on the formative processes in East Asian Esoterism. 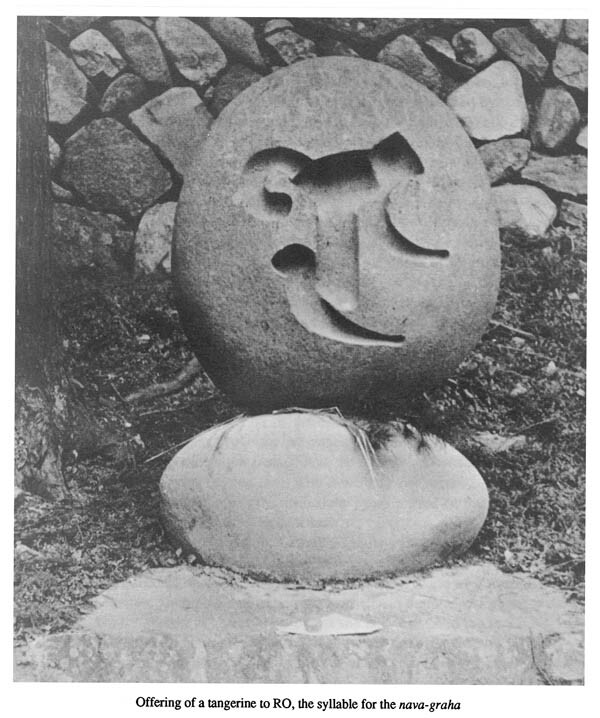 The meaning of the letter A in Sino-Japanese exoteric and esoteric texts, meditation (ajigl) as a fundamental practice in Mantrayana, its philosophical interpretation in the systems of Subhakarasimha and Amoghavajra are discussed. 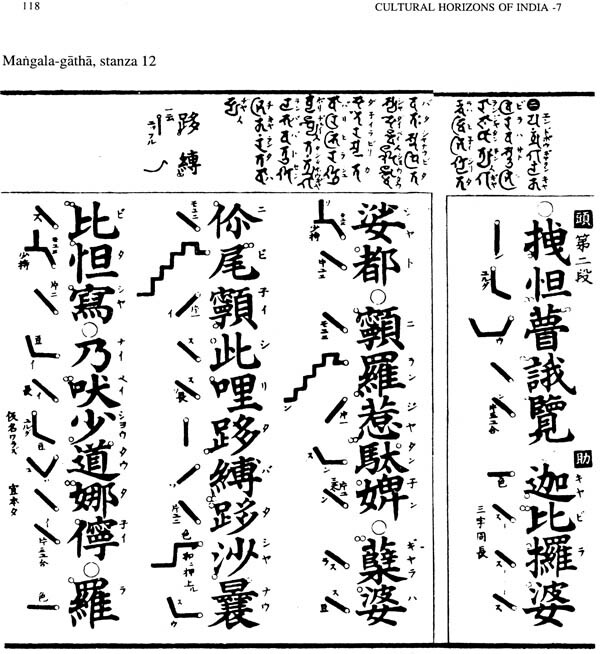 The Tamil sound-sequence of the Japanese alphabet opens new perspectives. It is followed by Siddham in Japan. The cultural identity of Japan and its response to European technology as a creative catalysis is discussed. 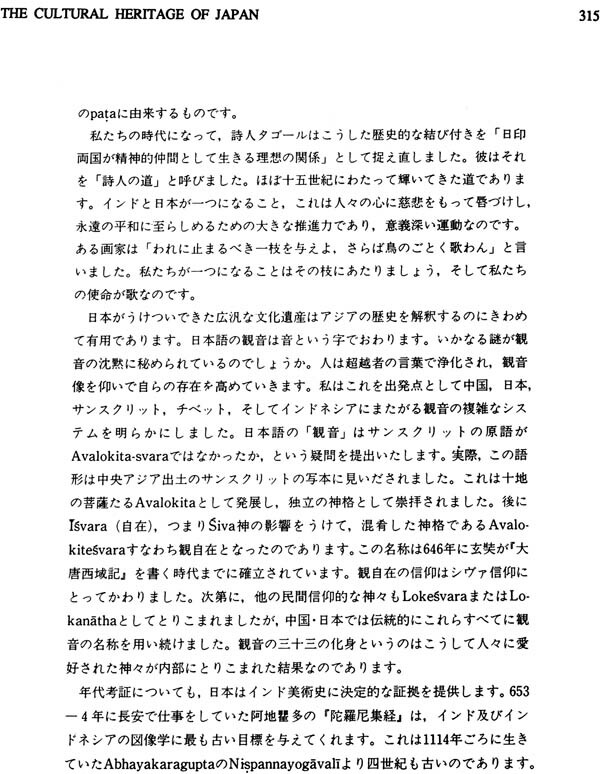 The Japanese version of the paper "The Cultural heritage of Japan" appears at the end. The role of Buddhism in Korean civilisation has been a profound social and cultural order and has given her the expanding horizons of today. Sokkur-am cave of the eighth century, has been re-interpreted in the light of the Gandavyuha-sutra of the Avatamsaka. The section on China commences with a survey of the Confucian Analects. The name of Pao-ssu-wei has been reconstructed as Cintamani. 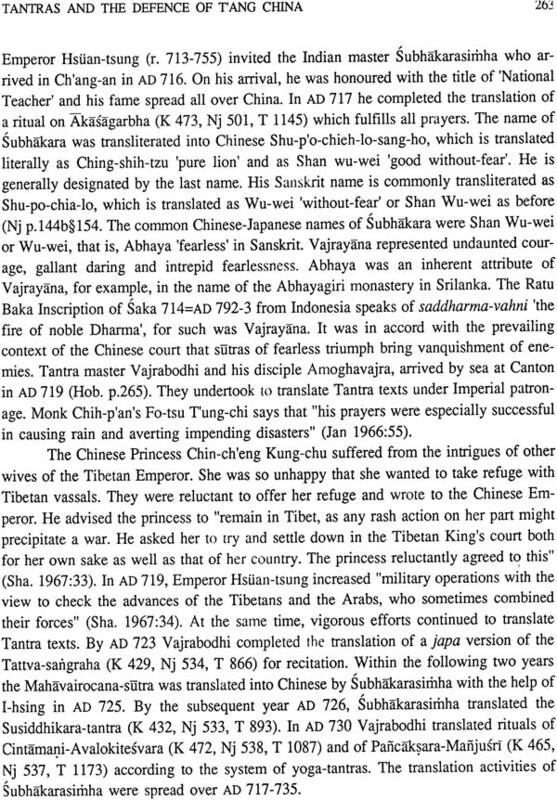 The linkage of tantras to defence in T'ang China, particularly in the reign of emperor Hsiian-tsung has been discussed. 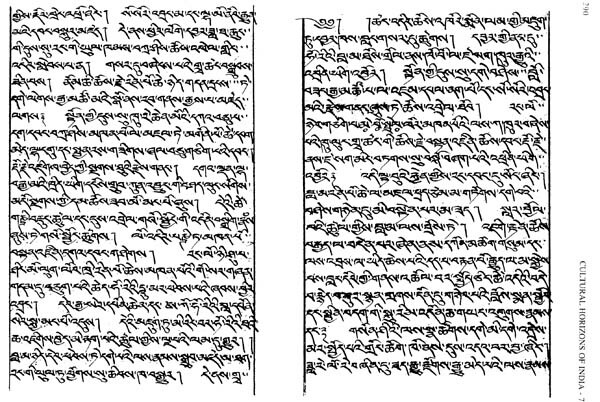 The Mara-vijaya-stotra has been reconstructed from its Chinese transcription. 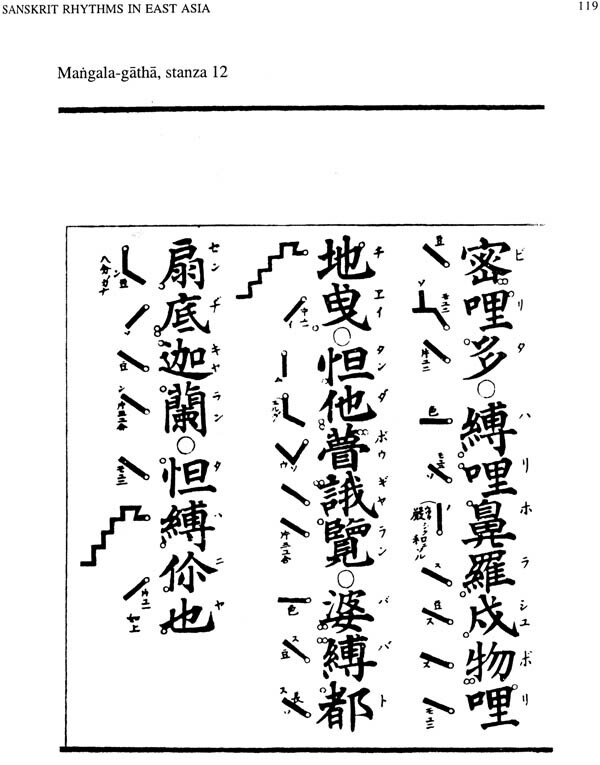 The oft-discussed Manchu Kanjur has finally been discovered to be a selective translation and adaptation of the Chinese Tripitaka. The author points out how Buddhism has been the interior world whose individual and social roots have conditioned the East Asian miracle during the last four decades. The plurality of the Buddhist tradition has provided the assimilable positive in the European models to move beyond into a creativity of the new. The third volume of the Cultural Horizons of India begins with a new perspective on the evolution of tantras, based on Pali, Sanskrit, Chinese, Tibetan, Indonesian, and Simhalese sources. The development of texts of this genre, iconographic efflorescence, multiple strands of ritual, sculptures and paintings over the centuries contribute to a new understanding of the origins and ramifications of the tantras. The mingling of Indian, Iranian and Hellenic ideas and their reflection in the transmission of Buddhist concepts and practices to China and thence to Japan open up new possibilities of interpretations. The light cults lead to Maitreya, Amitabha, Rocana of the Avatamsaka and Vairocana of the carya and yoga tantras. 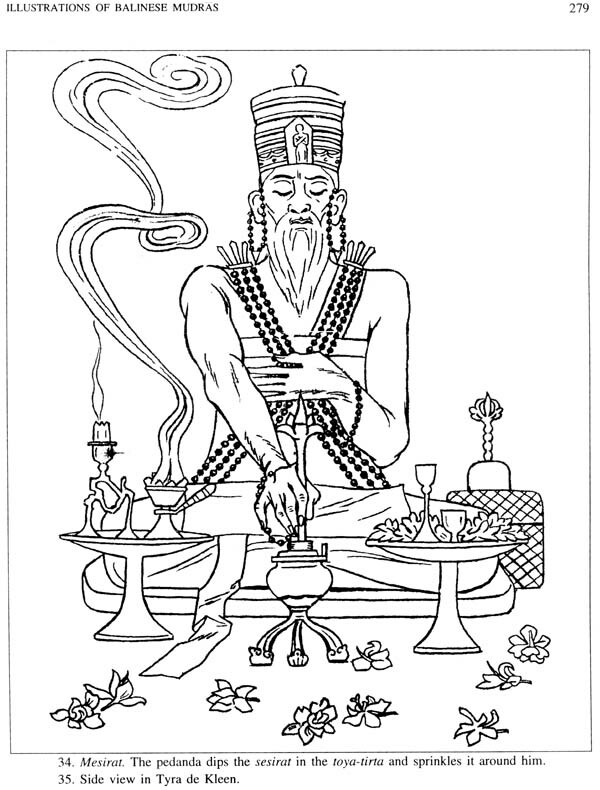 The deification of kings and colossi of the Avatamsaka in Afghanistan, China and Japan are a crucial stage in tantra development. The continuity of the tantras can be seen in Chinese Vaipulya texts from the second century onwards. The etymologies of Trapusa and Bhallika, the first lay disciples of the Buddha, from Chinese and other sources lead to the NW. The first stupa erected by the two merchants during the life of the Buddha himself sheds new light on the evolution of the stupa. 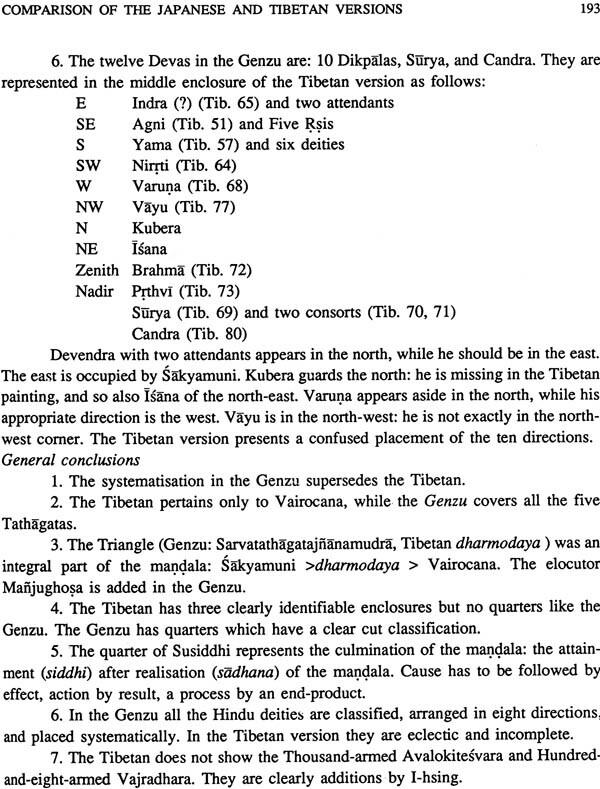 After a detailed analysis of the term Oddiyana, a new interpretation is provided which will change the prevalent ideas about the origins of the tantras. A stone inscription of Kuluta from Mathura and the names of the two Kushan princes on their portrait statues read anew as Naz and Mastana point to the Iranian onomastics of the Kushans. 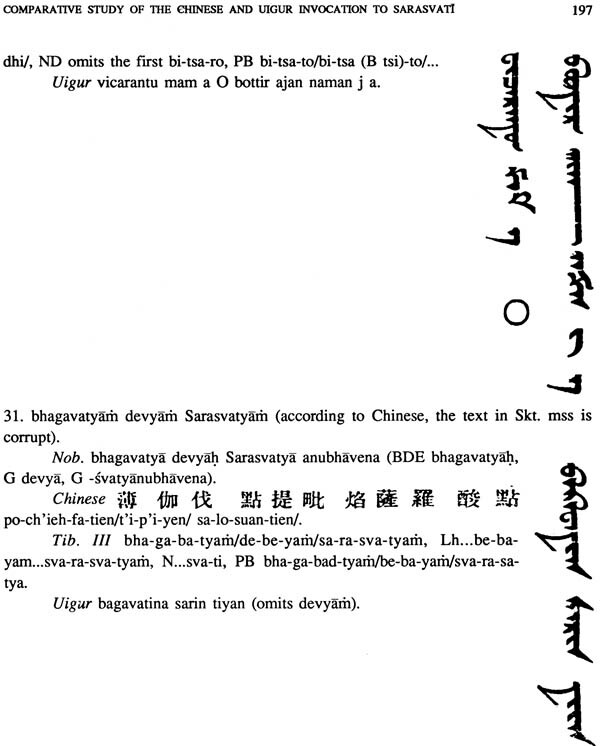 Comparative study of the Chinese and Uigur invocation to Sarasvati from the Suvama-prabhasa-sutra shows the importance of Uigur fragments for the study of Buddhist texts. Comparison of the words of dharants brings out their latent meaning, intentionally given an esoteric reconditeness. The Gilgit fragment of the Pratimoksa-sutra supplies hitherto missing portions of the Vinaya of the Mula-sarvastivadins. The multiple strata that go into the formation of the legend of Krishna have been pointed out in the 9th chapter. The Silk Route culminating in Tun-huang has been termed the Sutra Route as it lived as long as Buddhism flourished on both its northern and southern routes, bringing together many races in companionship. 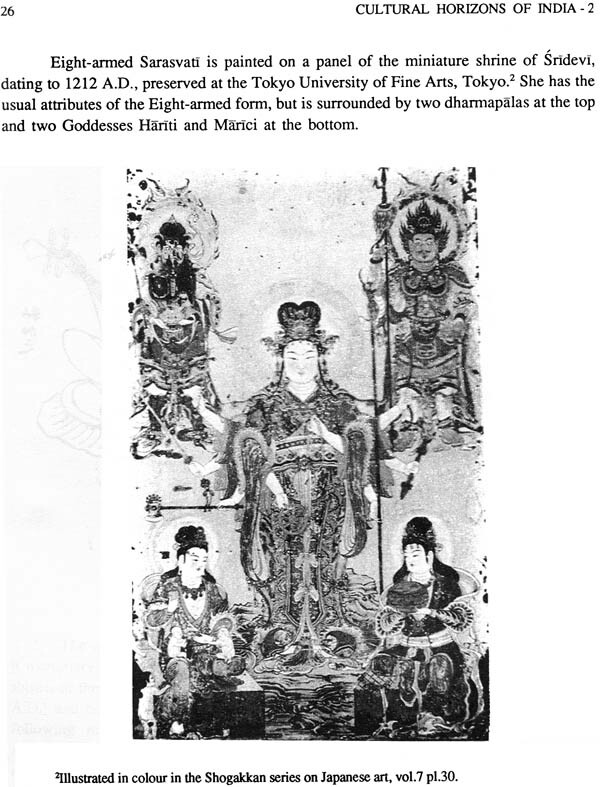 The iconography of Avalokitesvara in Tun-huang paintings has been classified into 50 types. 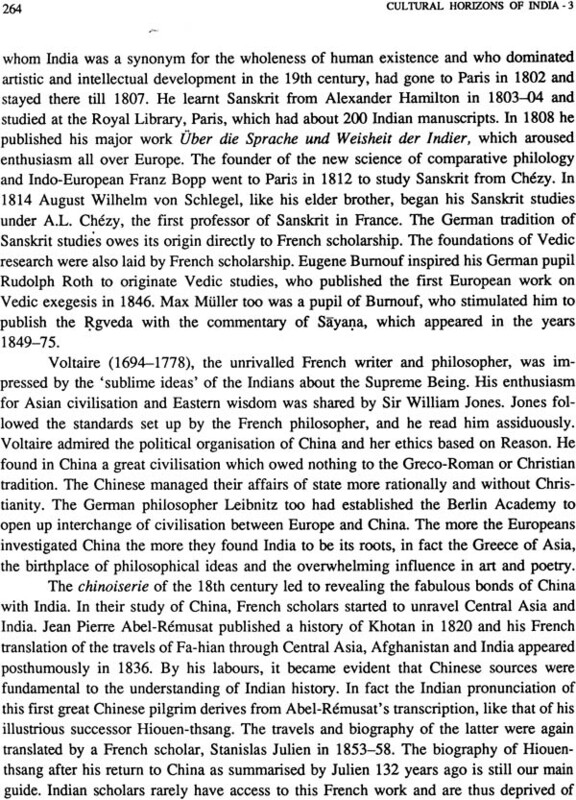 French researches on the interrelation of India, Serindia and China, Ayurveda in Asia, and the flesh and blood of time in Indo-European languages, Samkhya, Buddhism and modern physics add to the value of the volume. 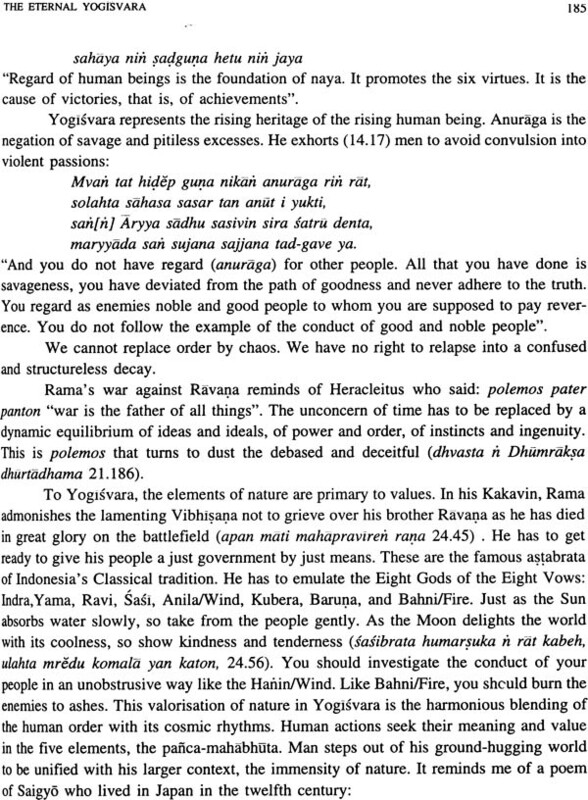 The Cyavana- Vidan- vat legend and some other passages of the Jaiminiya-brahmana are discussed. 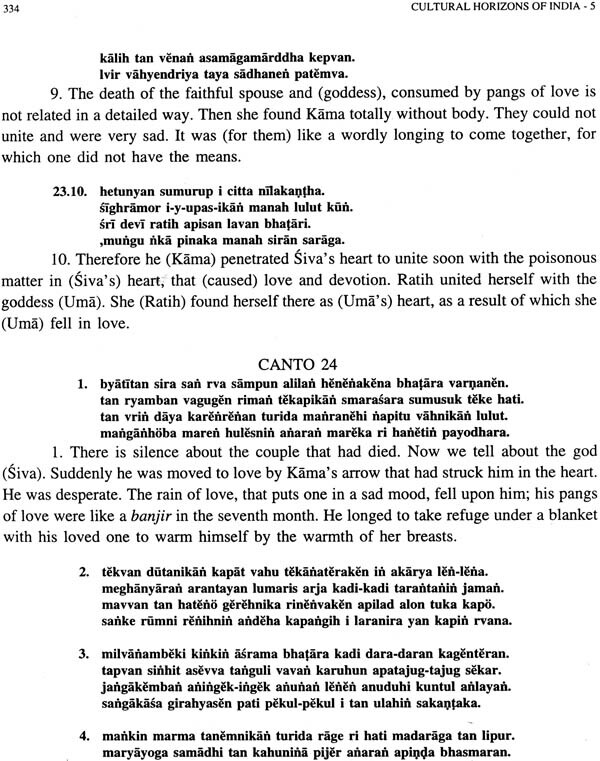 A Sanskrit text on alankara from Indonesian lontars is a specimen of the ancient pedagogical methods; in fact, it is a lively record of how Sanskrit was taught in Classical Indonesia through the direct method. 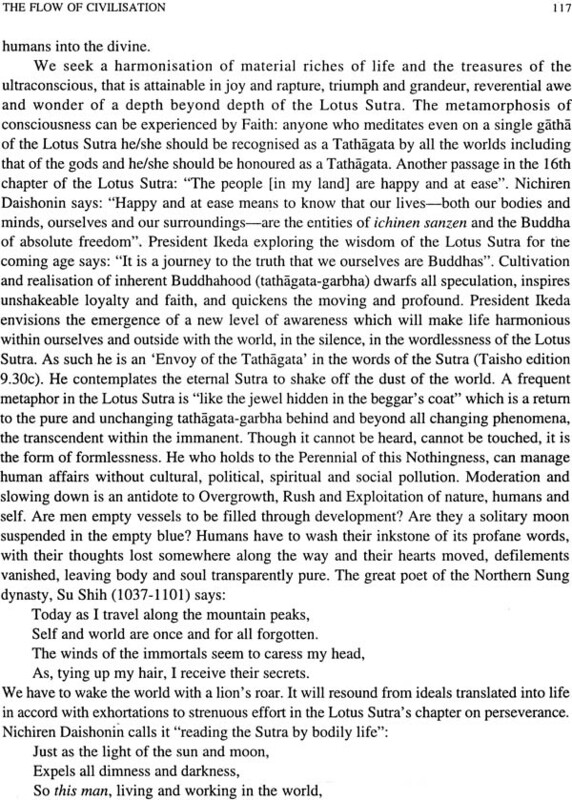 The Lotus Sutra/Saddharma-pundanka plays a crucial role in contemporary Japan in new lay movements. The Soka Gakkai International and its President Daisaku Ikeda have put this Sutra in the centre-stage. Prof. Lokesh Chandra presents a detailed study of the thought of President Ikeda. 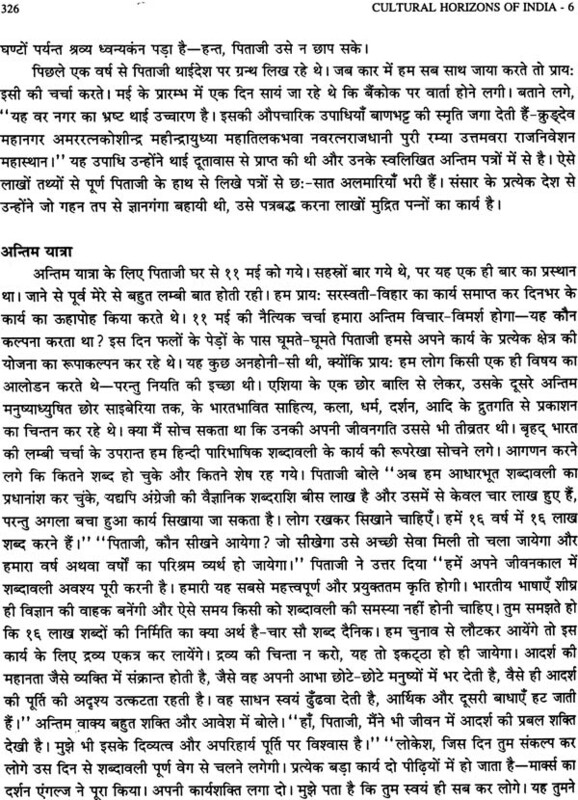 The very first article of Prof. Lokesh Chandra published in 1943 on the Mani stone is reproduced as it was written half a century ago. 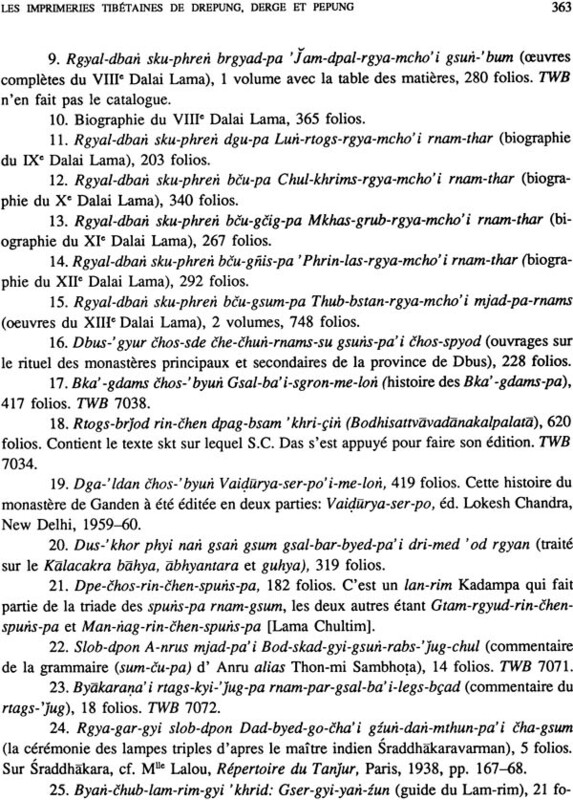 The list of works xylographed by the printeries of the Potala at Lhasa, Drepung, Derge and Pepung, Mdzod. Dge sgar.gsar are unique sources for the history of printing. 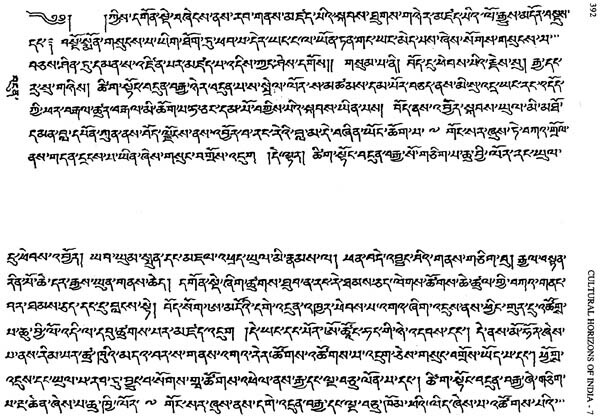 The Nama-sangiti has been commented upon by hundreds of Indian, Tibetan and Mongolian scholars from the standpoint of different tantric genres. The author discusses the meanings of its title in several traditions and its affiliation to various tantras. The life and works of Hjam.dbyans.bzhad. Pa I are given. He is celebrated for his manuals of study (yig.cha), highly esteemed among the Gelukpas. 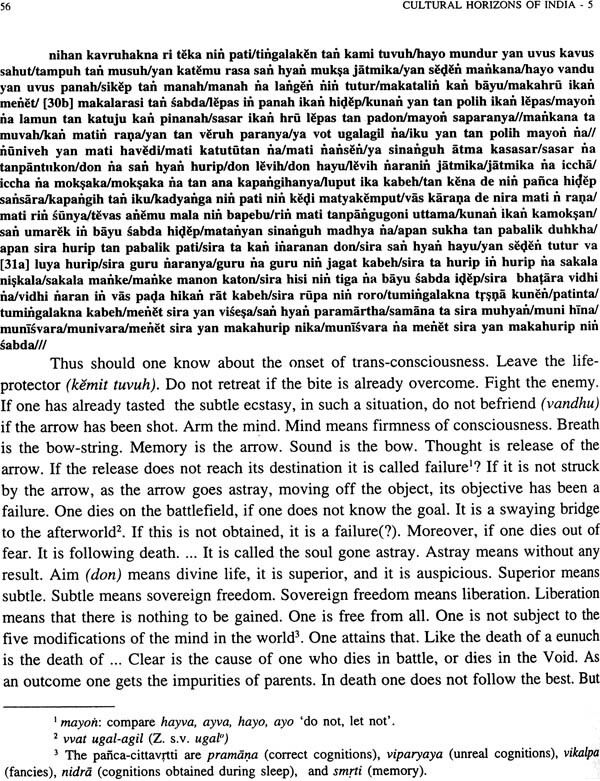 Sum.pa.mkhan.po's treatise on horses has been compared with three Sanskrit texts. 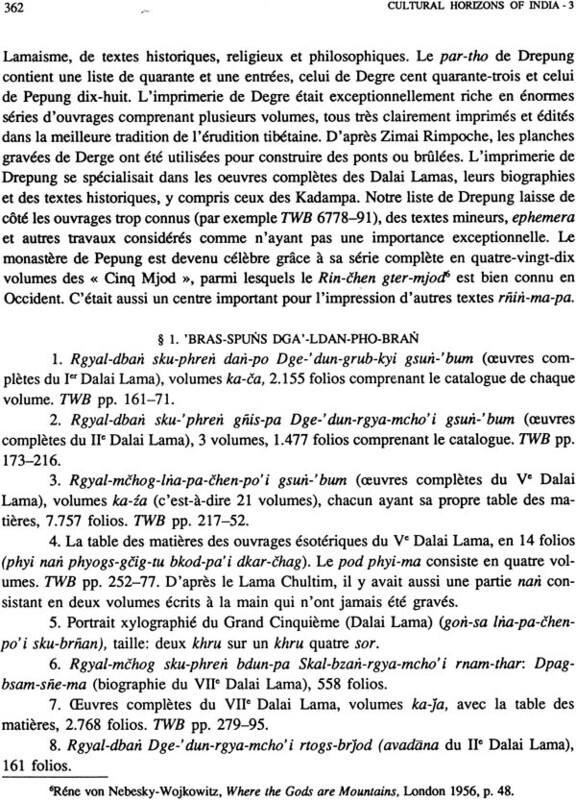 A conspectus of the Mongolian Tanjur and its comparison with the Red Peking Edition and the chronology of Buddhism in Buryatia from 1660 to the present day relate to Mongolian Buddhism. The volume ends with the iconography of Ganesa in Tibet. This volume is devoted to the art, history and literature; inscriptions, statues and thought; mandalas, epics and legends of Classical Indonesia, out of her long silence and magnificent resilience, that have triumphed over time. The energy of her culture is prompted by dynamic imagination. Its evidence is written on her rocks, her palmleaves, her bronzes, in eternal sculptures, on constellations of architecture, and in live wayang wong performances. The pure landscapes of her soul dream in the ensuing under notes to awakening tones. The very first topic, Sanskrit studies in Indonesia, deals with Krtabhasa genre, which are fragments of Sanskrit works, but of significance in preserving versions more ancient than the available texts. They shed light on the origins of the prose and poesy of Classical Indonesia. The second chapter on the contacts of Abhayagiri of Srilanka with Indonesia shows the role of Srilanka in the spread of Vajrayana. 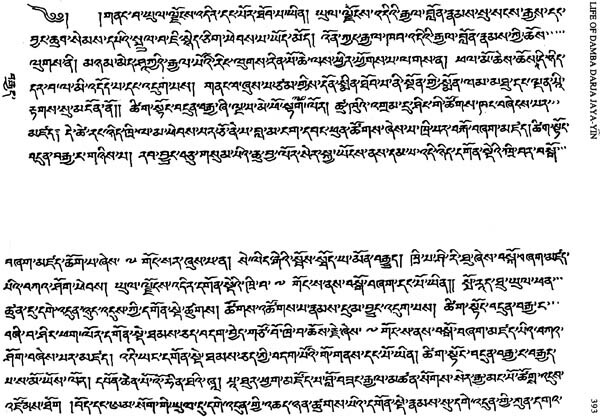 The Tantric texts translated into Chinese by Amoghavajra were also procured from Srilanka. The next three papers detail the manifestations of the Vajradhatu-mandala in the very architecture of the Sevu and Borobudur temples, Pavon as a sanctuary of homa rites, and the Mendut as an expression of the Garbhadhatu-mandala. 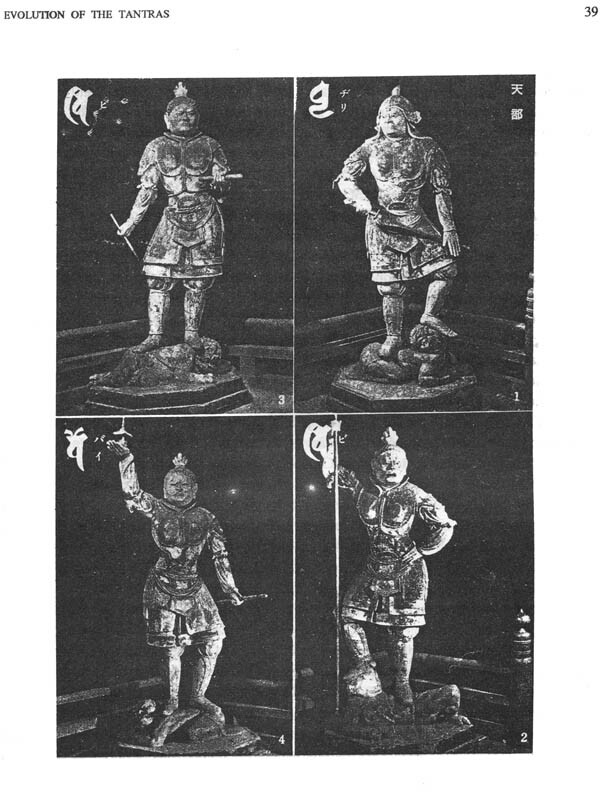 The bronzes from Nanjuk and Surocolo pertain to the mandalas of Vajradatu, Vajrasattva and Sixteen-armed Hevajra. The article of N.J. Krom on the Nanjuk hoard has been translated from Dutch into English and appended for its detailed descriptions. Mantrayana has Vairocana in the Garbhadhatu and Vajradhatu-mandalas, while Vajrasattva is the main deity of the Nayasutra which is still recited thrice a day in Japan. As a scripture of daily recitation, its mandala is crucial. 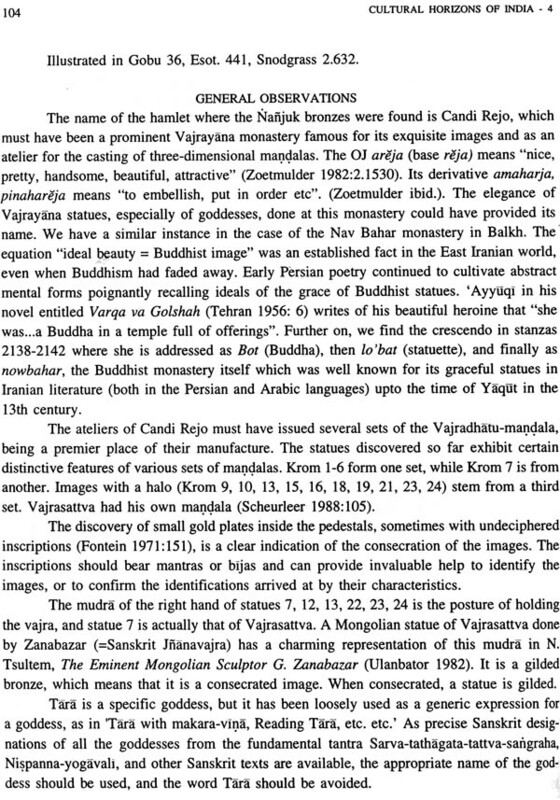 The paper points out the centrality of Vajrasattva which had eluded earlier scholars and identifies the bronzes of his mandala. 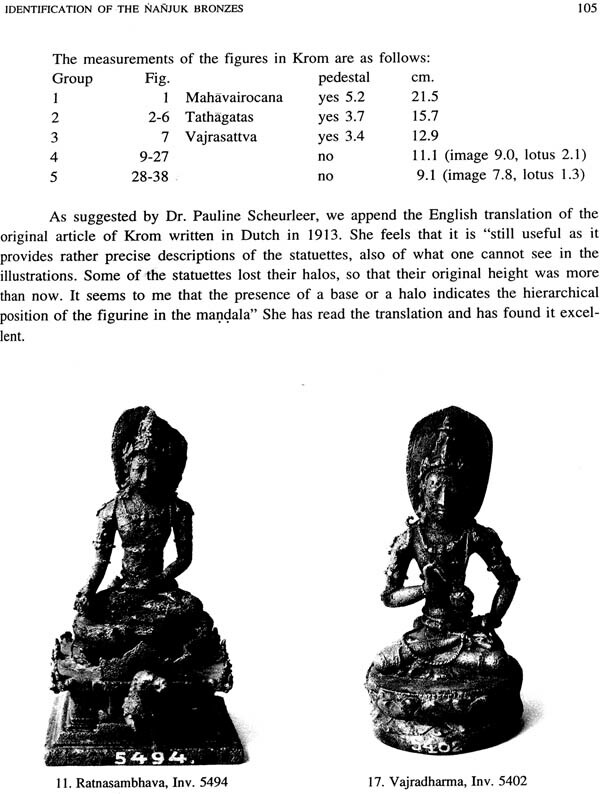 The remaining statuettes of Surocolo are from the seventeen-deity mandala of Hevajra. 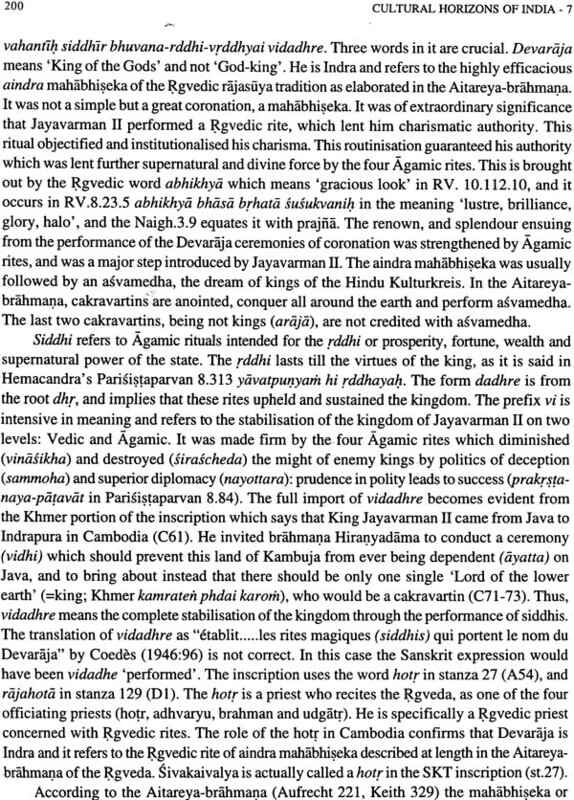 The Jaka Dolog inscription of King Krtanagara has been re-interpreted, and related passages of the Nagarakrtagama have been translated afresh. 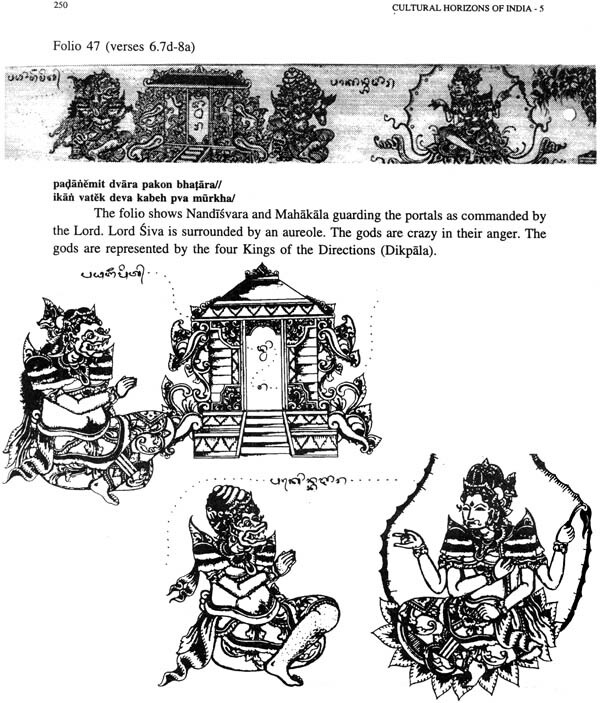 The image of Siva in Candi Jajava as described in the Nagarakrtagama had an Aksobhya in the crown: it prompts a new rendering of the verses of the chronicle. The goddesses at Chandi Plaosan Lor have led to the exploration of the extant dharani-mandala at Alchi. 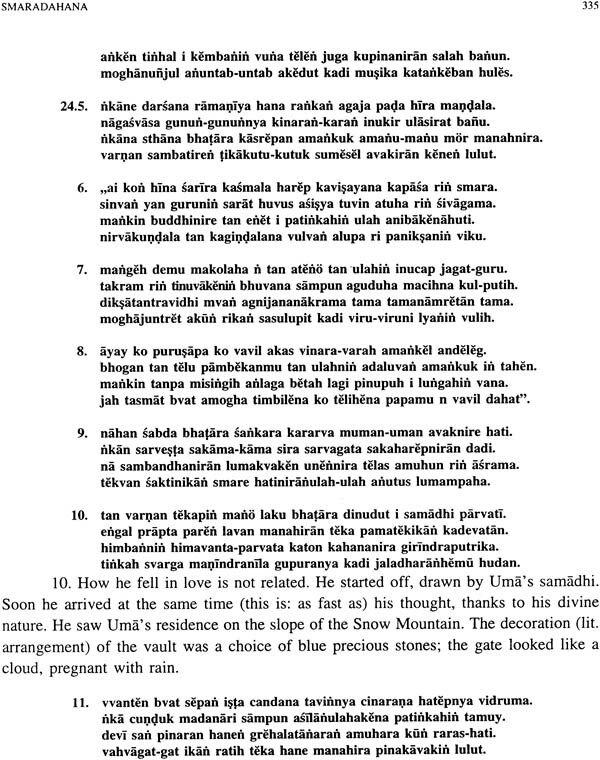 The copperplate inscription of Hariti has been translated anew in its functional context. Recently we have discovered this dharant in Japan written in the Siddham script as well as transcribed into Chinese characters by Amoghavajra. The eternal Yogisvara is a perceptive peep into the landscape of his spirit. Notes on Kunjarakarna bring to light the evolution of Rocana into Vairocana and thence into Mahavairocana, the prominence of Pratisara among the Five Protective Goddesses, and the meaning of vihara as a philosophical term. Nyai Lata Kidul, the Goddess of the Southern Seas, still venerated by the Sultans of Yogyakarta, symbolises and sustains the State. 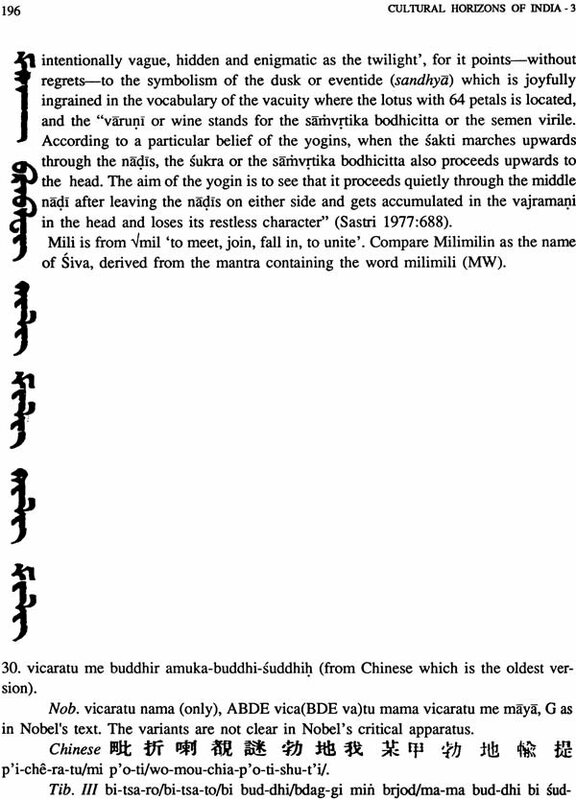 The Sailendras of Java re-examines the Ligor Stele, and leads to the conclusion that Srivijaya and Sailendras were separate political entities. Bima Bunkus is a lakon story in Kawi muda in Javanese metres. 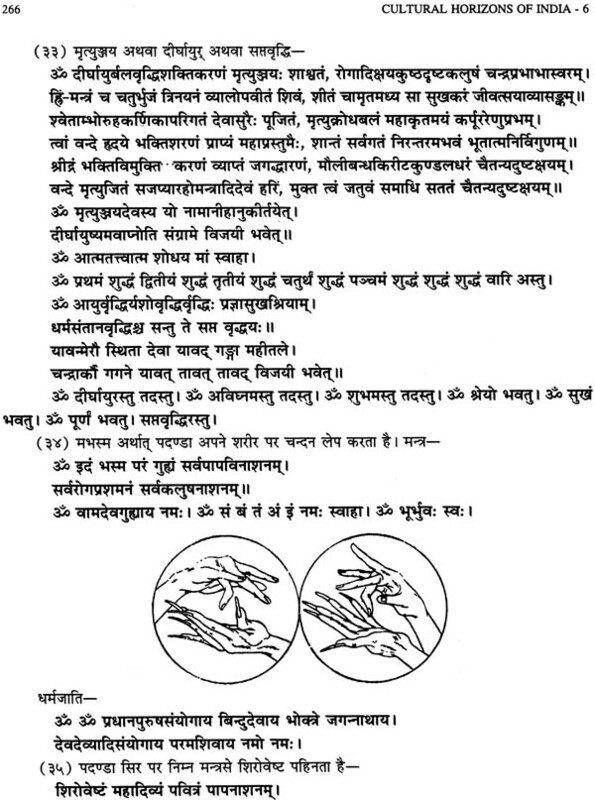 Illustrations of Balinese mudras, sketched for Prof. Raghu Vira in 1951 by two artists in Bali, have been reproduced for a precise comprehension of ritual. The San Hyan Kamahayanikan (SHK) has been translated and annotated extensively. It is a compendium of initiation rites and philosophical thought. It is explicitly structured in four stages of mahamarga, paramaguhya, mahaguhya, and paramaguhya. The SHK has been analysed and interpreted in the light of Chinese and Tibetan texts, which give the whole a coherence of thought and incisiveness of life. The fifth volume of the Cultural Horizons of India includes the writings of Prof. Lokesh Chandra on the philosophic, artistic, and poetic traditions of Southeast Asia. 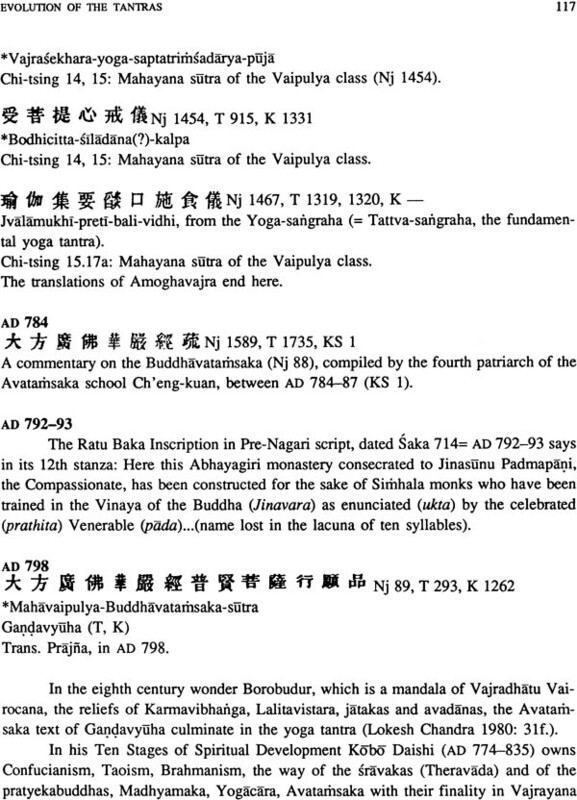 The Saiva version of the San Hyan Kamahyanikan (SHK) was cited in his edition of the Buddhist original by Kats. 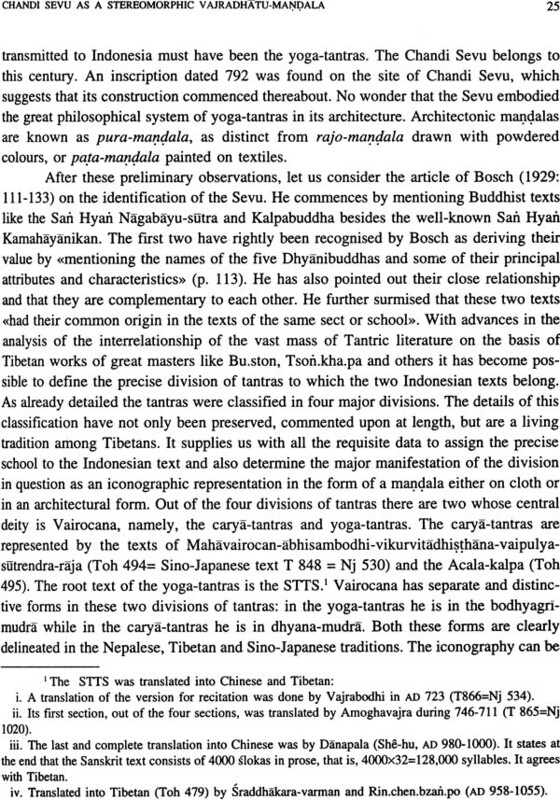 The excerpts gave a wrong perspective of both the Buddhist and Saiva versions in themselves, as well as their interrelationship. In this volume the complete text of the Saiva version enables us to see its transformation from a Buddhist text into a Saiva, after the first six folios. 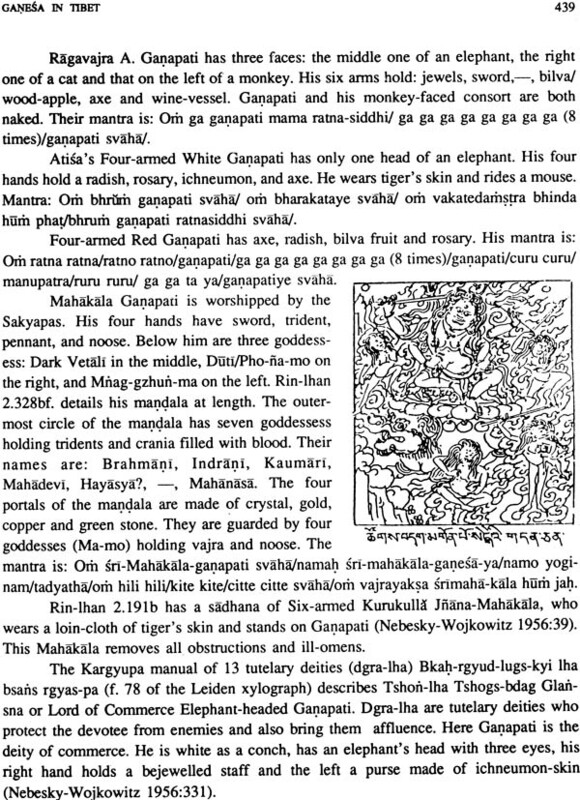 The five skandhas in a yogisvara lead to a mahapurusa who attains the Saiva sa kala and niskala. The change over took place during the reign of King Sindok who came to the throne in 929. His religious, cultural and literary achievements are celebrated in his inscriptions by the epithets dharmottunga- vijaya and dharm-otsaha. The Saiva text of the SHK is a fascinating peep into these processes of transformation and into the religious evolution of Java in the tenth century. The text has been edited, translated and annotated. 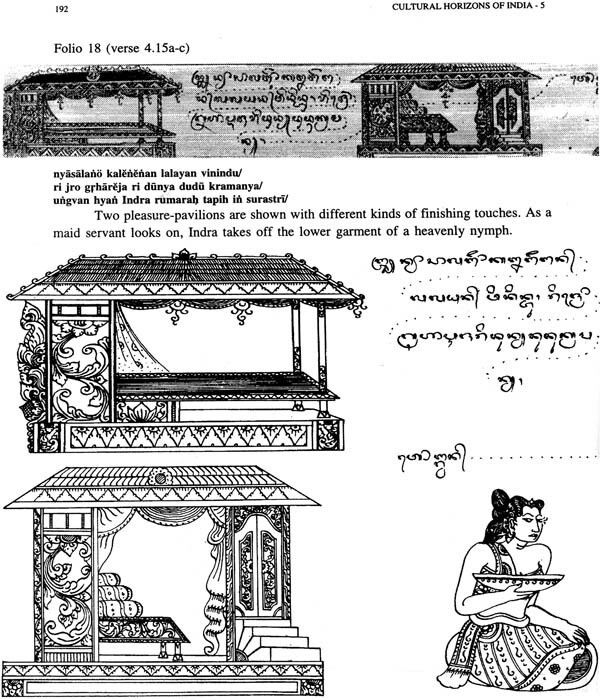 The Bhuvana-samksepa is a text of Saiva cosmology in Old Javanese with Sanskrit stanzas. It corresponds to the agamas in India. Its details Indonesian concepts about creation, evolution, existence, dissolution, macrocosm (bhuvana) and microcosm (sarira), yoga, sunyata, moksa and ends with the five kinds of fire-offerings or homas. The original text, variant readings, translation into English, and notes are by Dr. Mrs. Sudarshana Devi Singhal. An illustrated palmleaf manuscript of the Smaradahana has been reproduced from the Prof. RaghuVira Collection. The relevant stanzas from the poem, their English translation and notes on the symbolism of palmleaf art of Bali add to its comprehension. New line drawings by I Nyoman Sadra of Amlapura/Karangasem, Bali have been included to clarify the details. 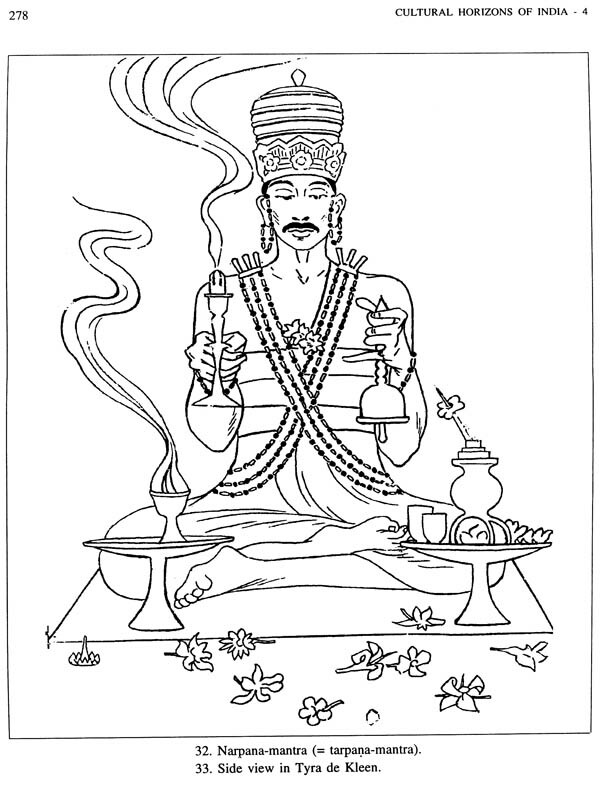 The Smaradahana poem was composed by poet Dharmaja as an act of homage to his patron King Kamesvara who ruled in the 12th century. It is a creative expression to celebrate both the ruler and the land ruled. The King sprung fr5om the penance of divine Ananga the unbodied joy and the rapture of the mountains and fountains, the skies and plains sparkling in the impulses of nature find an enchanted expression in the diction of poet Dharmaja. 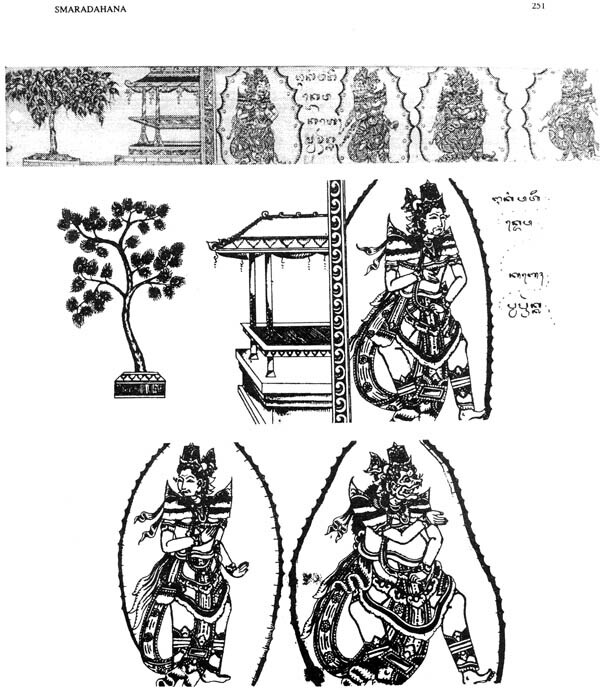 The complete kakavin/kavya in Old Javanese has been reproduced in romanisation with an English translation of the Dutch rendering of Prof. Poerbatjaraka by Ms. E. Wiegers from Uitgest (Netherlands). Literature cited and indices make the volume highly accessible. This volume of my scripta minora includes studies that have been finalised during the last five years. 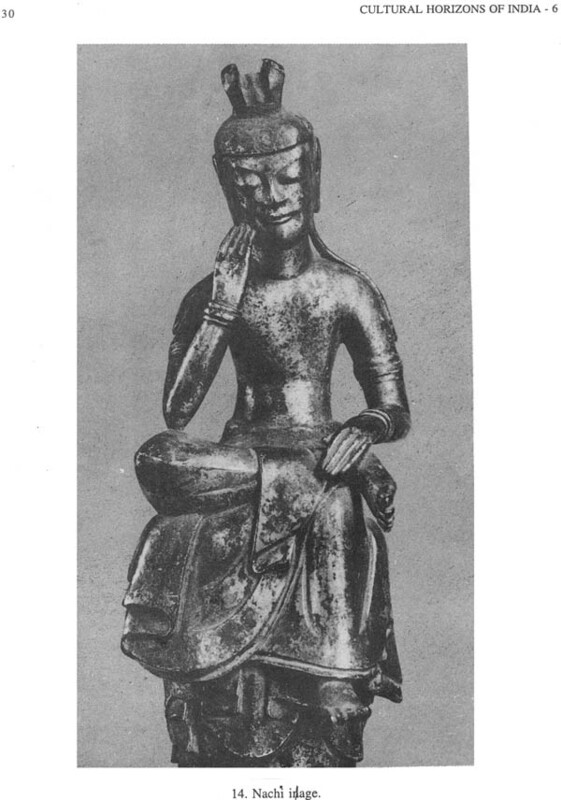 The first chapter deals with pensive images seated in half-locked posture (hankaza) found in China, Korea and Japan. They had been hesitatingly identified as Maitreya, which raised a number of problems vis-a-vis the traditional iconography of the Buddha-to-be. This chapter brings new evidence for the interpretation of the triune images of Maitreya and his disciples from East Asian sources as well as from Tibet. It becomes clear that the hankazo images are of Asanga, also known as Maitreyanatha 'the bearer of the Maitreya tradition'. The fifteen major images, the several sculptured triunes in the Yun- kang caves and on Tibetan scrolls have been discussed at length. The colossi at Bamiyan, Yun-kang and Tun-huang are treated in the second chapter and identified as Maitreya or as Rocana of the Avatamsaka sutras which speak of Rocana (or Virocana) as Abhyucca-deva. 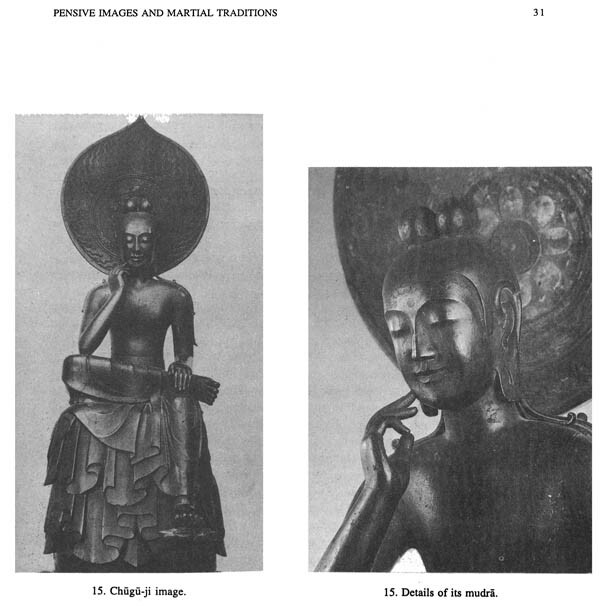 Buddhist texts provide proofs for a fresh identity of these images, in their appropriate contexts. Korean and Japanese colossi at Sokkuram and Todai- ji monastery evidence their historic role in the state: flamonium and regnum in one. The third chapter on Srstikarta Lokesvara with twelve emanations correlates the bronze with its originating text, namely, the Karanda-vyuha, and helps to name it, which had eluded Getty and successive scholars. The iconography of Thousand-armed Manjusri by Gauri Devi (Mrs. Lokesh Chandra) is based on a Buddhist sutra translated into Chinese by Amoghavajra in 740. This Manjusri is painted on the walls of the Tun-huang caves in a number of places. A Sanskrit text related to this Manjusri has been preserved in Japan in the Siddham script. 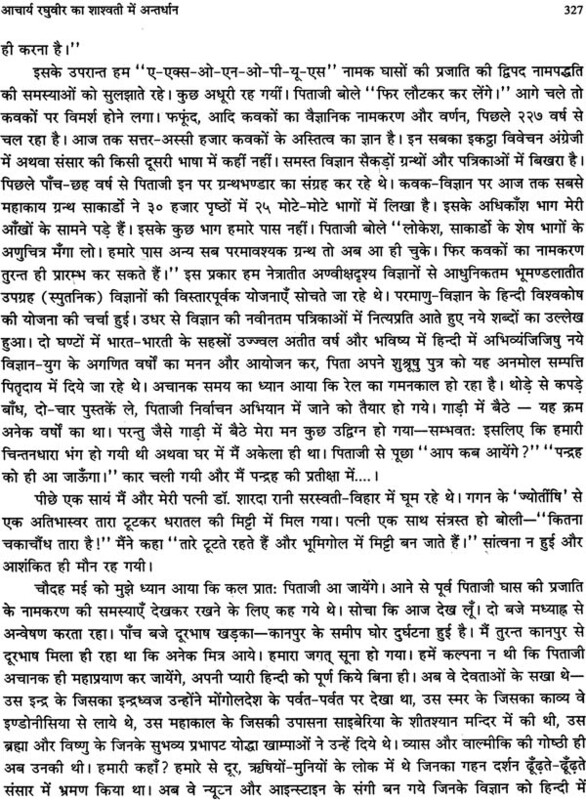 This has been reproduced along with its edited version in Devanagari script. Calligraphy in Siddham is a living art in the vigorous strokes of the stylus or in the vastness of the brush. 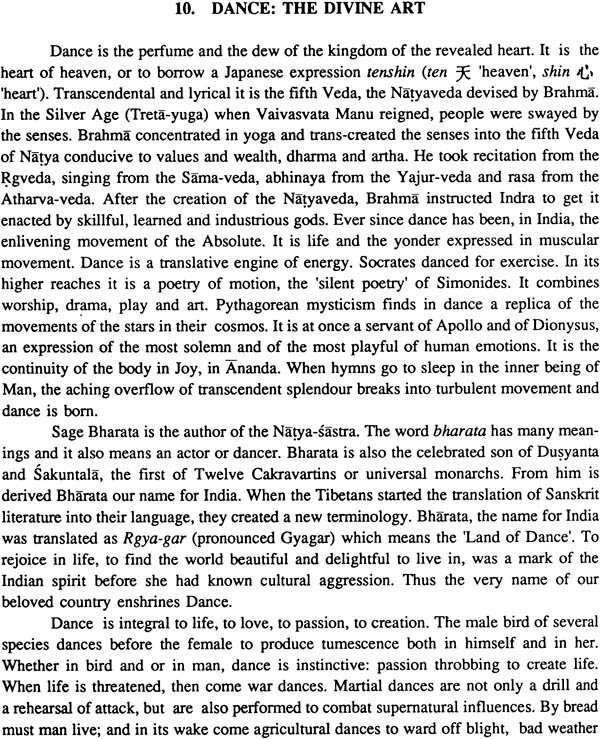 The fifth chapter is an evaluation of the Siddham calligraphy of Prof. Nagara Gyoko, as the fetters of the brush fall away to become the irradiating, vivifying, dancing rapture of being as well as non-being. The Tibetan state was formed as early as 247 BC and its continued evolution has been a fact of history. The sixth chapter outlines its formation and consolidation, the military victories of Tibet in the seventh, eighth and ninth centuries in Central Asia as well as against China. The kingdom of Guge in Western Tibet played a crucial role in the defence of the Himalayas against the onslaughts of Central Asian fundamentalism. The seventh chapter on Mongolia is a short statement of the destruction of their priceless cultural heritage and mass murders of the lamas. The Mongolian people are trying to resurrect their culture. The next chapter is a survey of the studies carried on from 1941 to 1989 on Mongolian culture by Prof. Raghu Vira and his school. The ninth chapter integrates the present to the future in the deeper flow of civilisation and the next one deal with the decline and disappearance of Buddhism in India. The ensuing chapter on identity discusses the many manifestations of exclusivism, religiomartial aristocracy contraposed to the open text tradition, contemplation, and a never- ending quest for the Sanatana. The twelfth chapter is on a Ming jar with Sanskrit mantras, which shows that as late as the 14th century Indian pandits like Sahajasri were present at the Imperial Court of China and supervised spiritual affairs of the Emperor. The thirteenth chapter surveys extant Japanese scrolls of Buddhist iconography from the seventh to the fourteenth centuries. They are exceedingly rich sources for Buddhist iconography, with drawings and their names inscribed. They await research. The fourteenth chapter is an edition and annotated translation of the Old Javanese Chanda-karana 'The Art of Writing Poetry', which Prof. Poerbatjaraka considers to be the first literary work of Classical Indonesia. It is a rich source for grammar, metrics, rhetorics and lexicography. 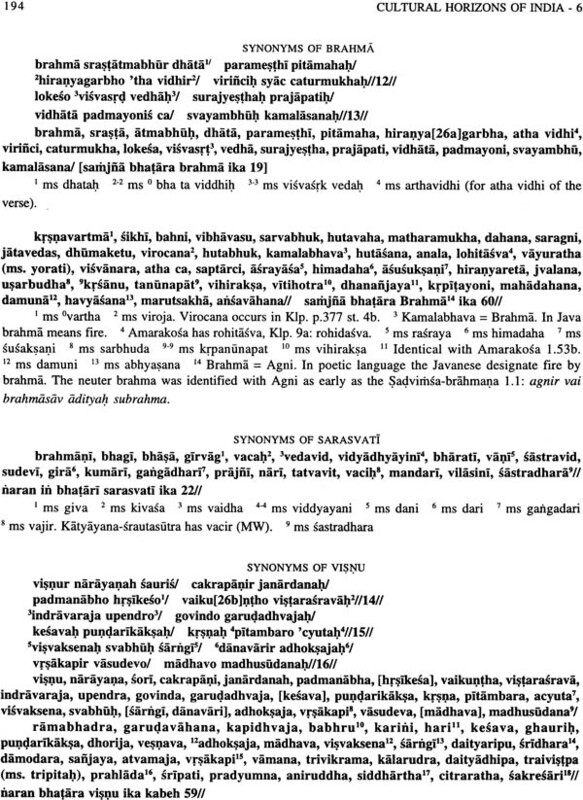 It preserves extensive quotations from the now-lost Amaramala which was a precursor of the Amarakosa. As such it is of unique value for Sanskrit studies. At the end are my papers in Hindi on the cultural relations of India and Mongolia, etymologies of Persian words, Javanese vocabulary, Balinese rituals, mantras and mudras in Balinese worship, Ramayana in the performing and pictorial arts as well as literatures of Southeast Asia, the international Ramayana conference in Indonesia, and finally various papers I wrote on the life and work of my father Prof. Raghu Vira when he left for the heavenly fields in 1963. This is the final volume of my minor writings and articles, most of them not published earlier. The first is a study of Sanskrit hymnology in China, Korea and Japan from the early centuries preceding the Christian era. The nomenclature of psalmody, the trickling of music from NW of India as the MahaTukhara raga (Chin. Mo-ho-tou-le) which was brought to China by the Han envoy Chang Ch'ien around 126 BC, and the compositions of Prince Ts'ao Chih (192-232) of the Wei dynasty are the glorious beginnings of Sanskrit and Buddhist psalmody in China. It flourished over the centuries. In the fourth century the music of Kucha became the basis of West Liang music. 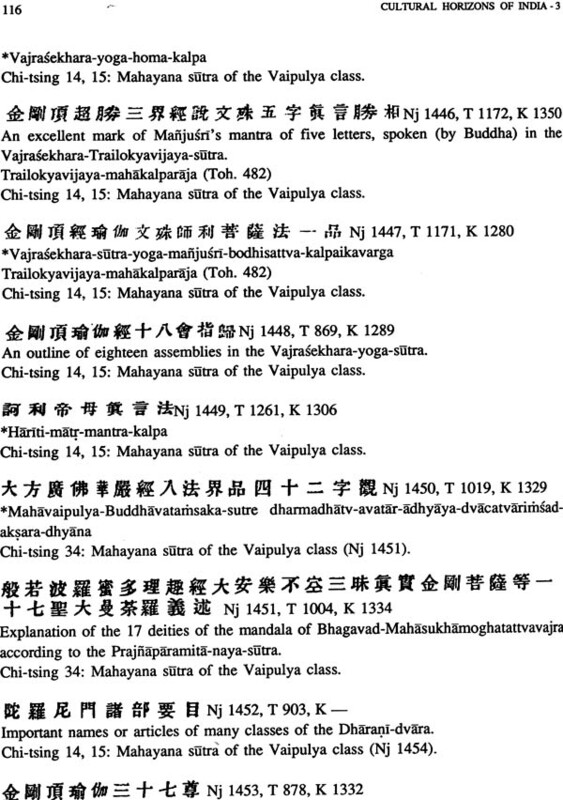 The references to music in Vinaya and in several other texts have been indicated in chronological sequence of their Chinese translations. The first Korean musicians arrived in Japan in 453. Goddesses of music and dance are represented on the walls of Tun-huang, In 568 Sujiva of the royal family of Kucha introduced the seven notes (sadharita, kaisika, sadja, sadja-grama, sadava, paficarna, vrsabha) at the Chinese court. The 'Ten Books of Music' edited in the Zhenguan periods (637-642) have a book on 'Indian Music'. 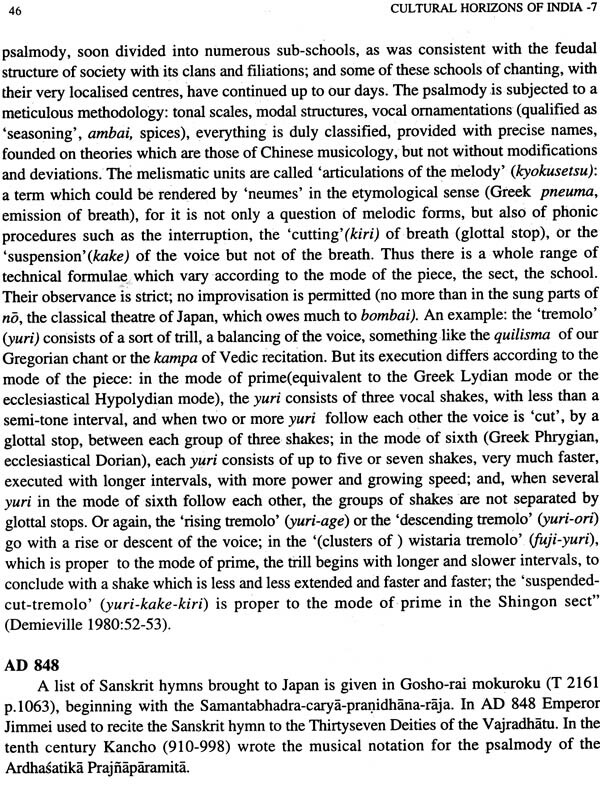 From the eighth century onwards, Buddhist music gained full development in Japan. In 752 Indian dance and music was introduced from Champa, including dances of the Bodhisattva, Pedu (the Horse in the Rgveda), kalavinka, Bhairava, Amba and so on. The oldest surviving musical notation is written on the reverse of a scrap of paper which is a receipt dated 26 July 747. 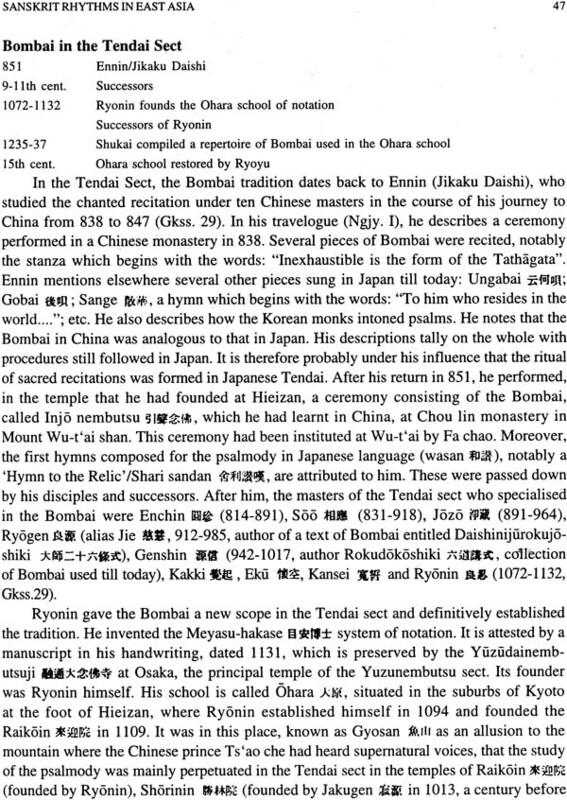 The music of the Shingon, Tendai, Hosso, Jodo, Shin, Zen, Nichiren and Yuzu-nembutsu sects has been outlined. Buddhist music in contemporary China, Korea and Japan serve to complete the picture. The musical theory and notation with examples from twelfth century manuscripts, vocal technique and finally texts set to psalmody are detailed. The hymns sung are in Sanskrit, Chinese and Japanese. Bugaku accompanying bombai in the Buddhist monasteries is followed by the lineage of shomyo music from Nagarjuna of the Tantras (7th century) down to the present day Japanese musicians. The repertoire of Sanskrit hymns is given in Siddham, and Chinese transcription with musical notation. The Mangala-gatha is treated at length. 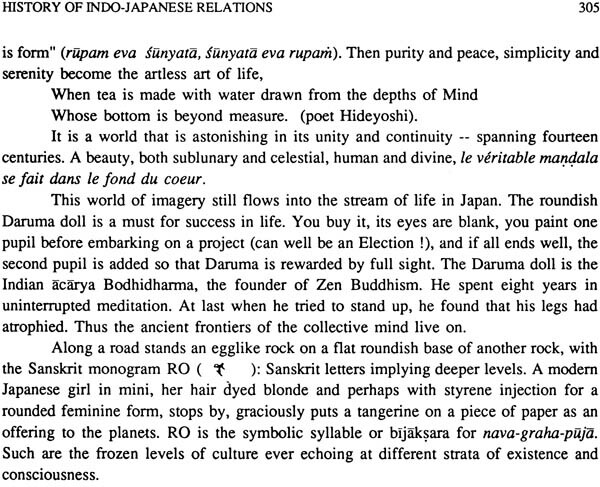 The second chapter is on the cultural interflow between India and Japan. It is followed by a new evaluation of the concept of devaraja in Cambodian history by an intensive scrutiny of the Cambodian inscriptions, rajasuya rites in the Rgveda and its Aitareya- brahmana, and the Indrabhiseka in the Thai classic Trai Phum. The fourth article is on kosa, the golden vesture of the palladium in Champa. A new interpretation of the seven inscriptions of King Mulavarman of Indonesia affords a fresh approach to the theory of the SE Asian State. Technical terms like jaladhenu and akasadipa occurring in the inscriptions have a new orientation. The meditative architectonics of the Borobudur in the light of the Abhidharma-kosa and other Buddhist sutras bring clarity and more specific correlation of the three realms (tri-dhatu) and the monument. The symbolism of meditational structures and their threefold classification clarifies the nomenclature of the Borobudur as a Sumeru. The Saiva renaissance under King Sindok and his successors and the translation of the Mahabharata under King Dharmavamsa Teguh are crucial to the history of East Java. 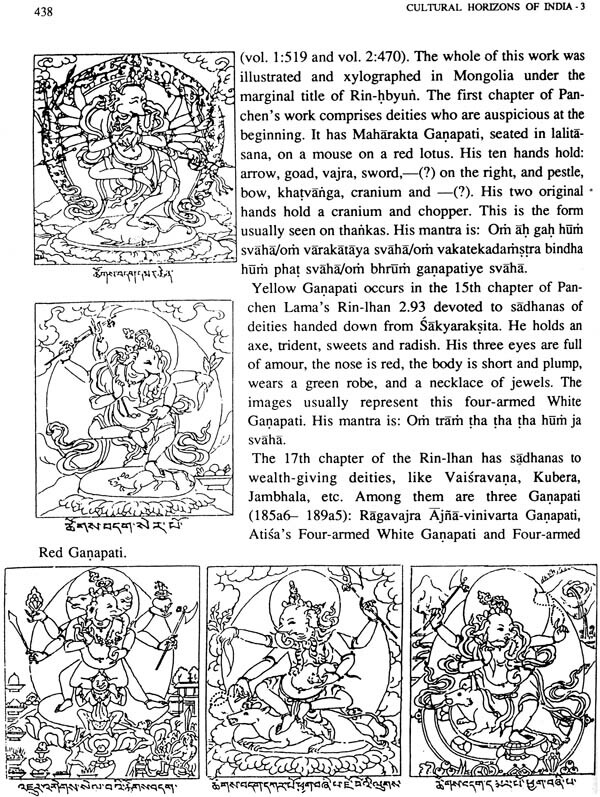 At the end, five Tibetan texts on Ganesa, beginning with a sadhana by Atisa, are reproduced. The first patriarch or Bandido Hambo Lama of the Buryat Buddhists from 1766 to 1777 was Damba Darja Jaya-yin. 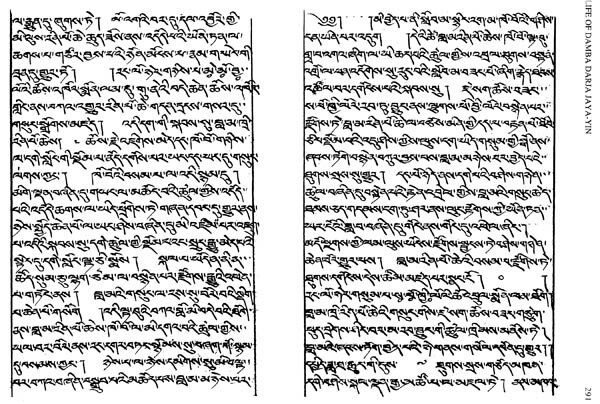 Short manuscripts in Tibetan containing his biographies end the volume.